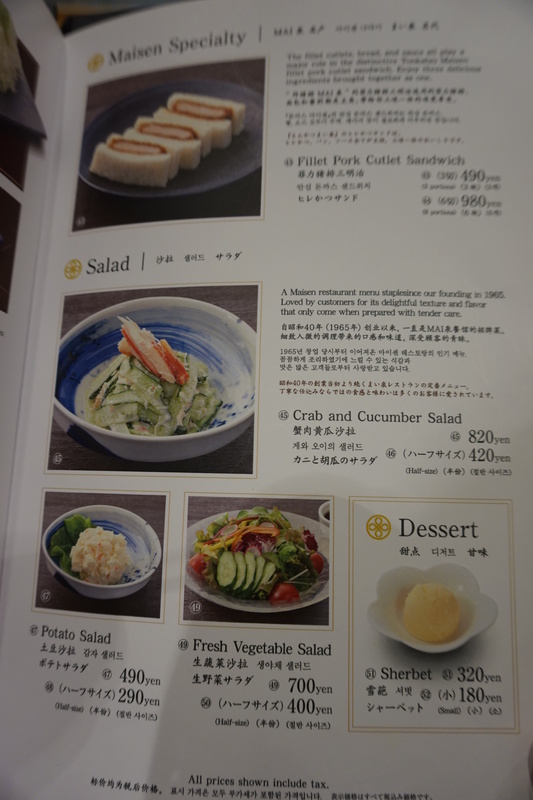 Lots of food photos. Don't read when hungry. 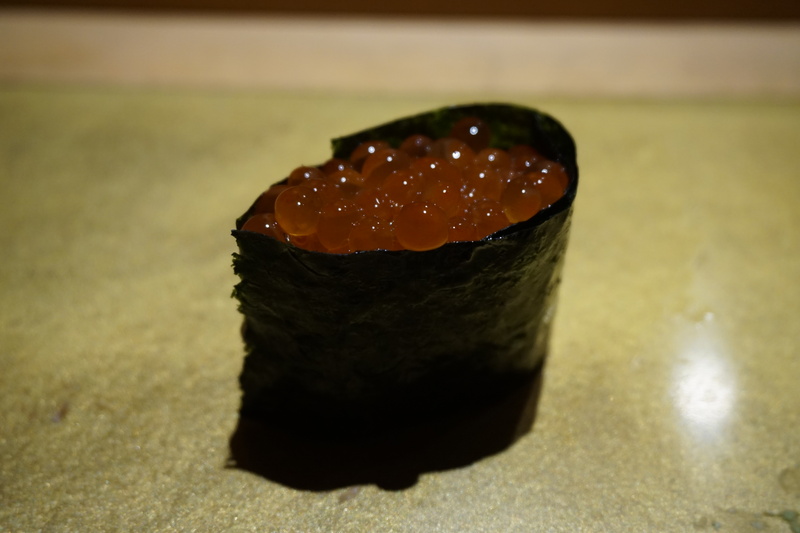 There is no shortage of dining guides to help you navigate the culinary mecca that is Tokyo, many of which are written by people with much more sophisticated palates. So I’d encourage you not to take whatever’s written below as comprehensive or gospel. 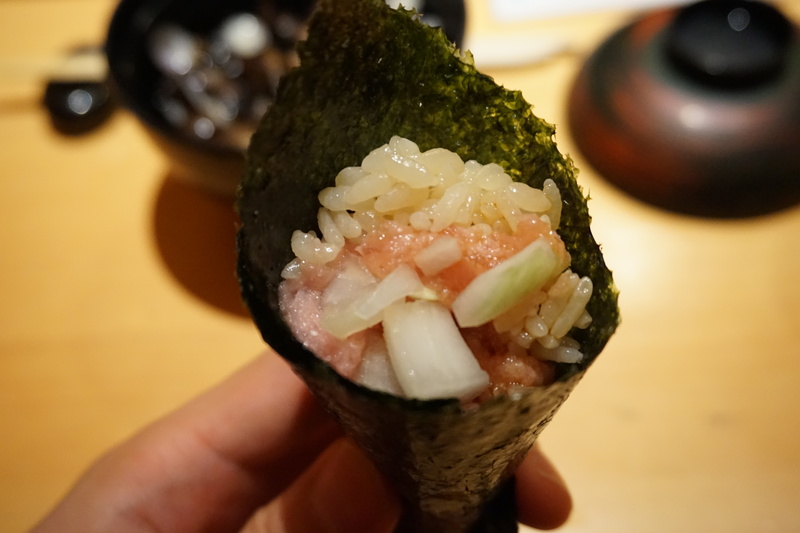 These are simply some of the restaurants I tried during my trip that I thought were great. 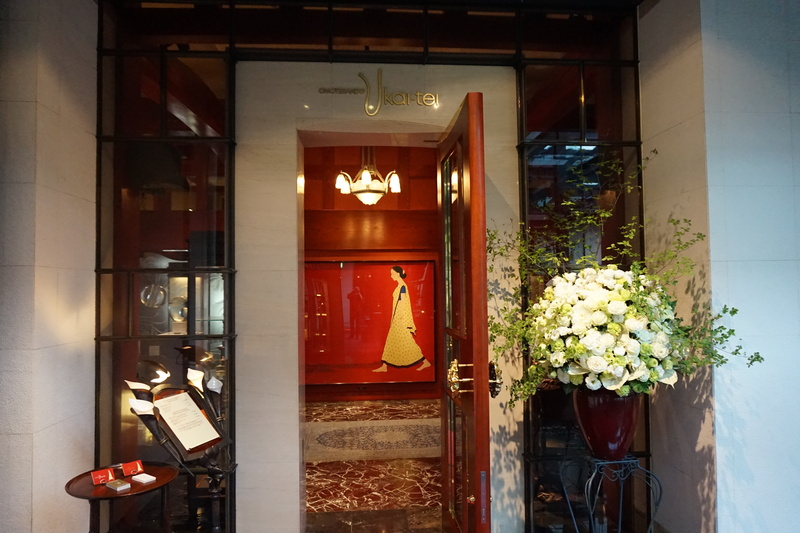 Better yet- a lot of the restaurants here don’t need to be booked by a concierge. 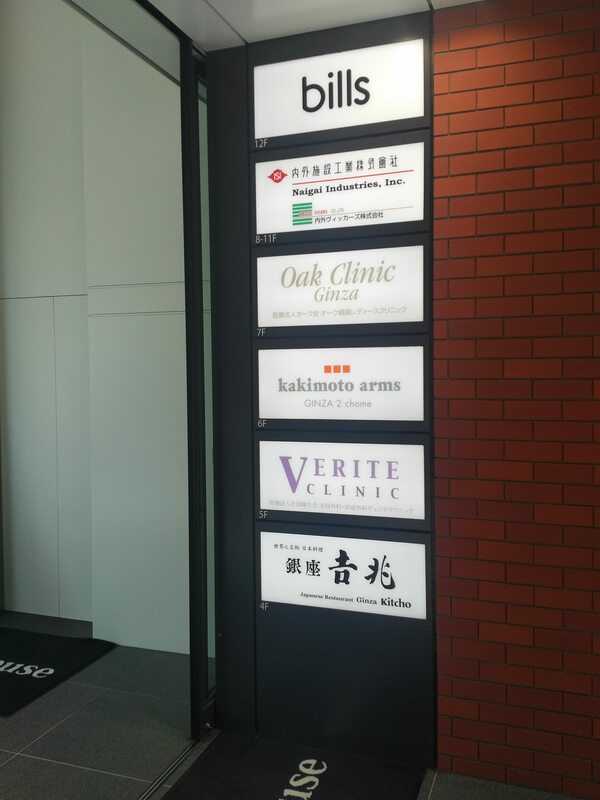 Most of them either take online reservations or have English speaking staff that can help over the phone. This can be useful if you’re staying in an AirBnB instead of a hotel. 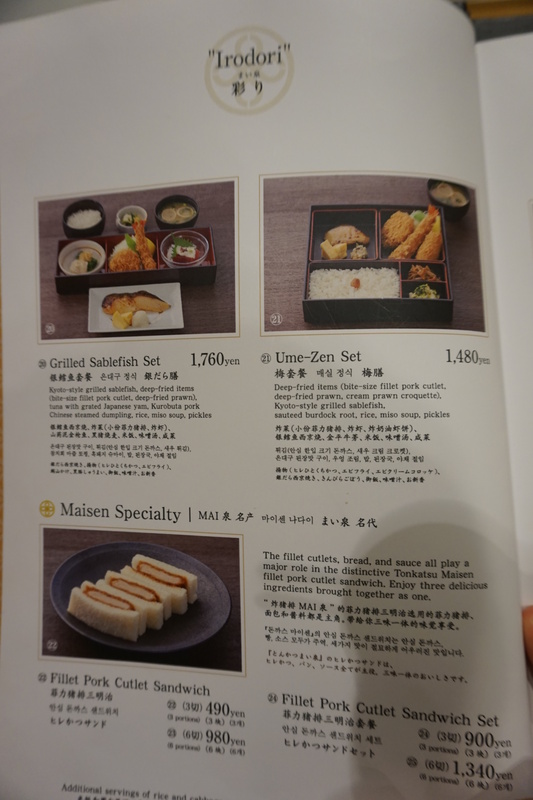 Many restaurants in Japan have excellent value lunch sets, but come dinner time you can expect to pay 3-4 times that amount (the idea is to attract Japanese salarymen, who don’t want to pay much for lunch). 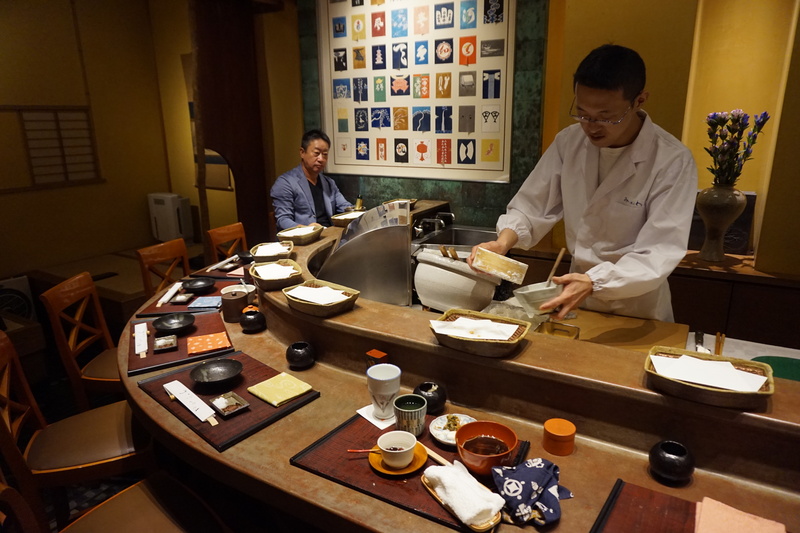 Therefore the advice to tourists looking to book good sushi joints is to always go for lunch. 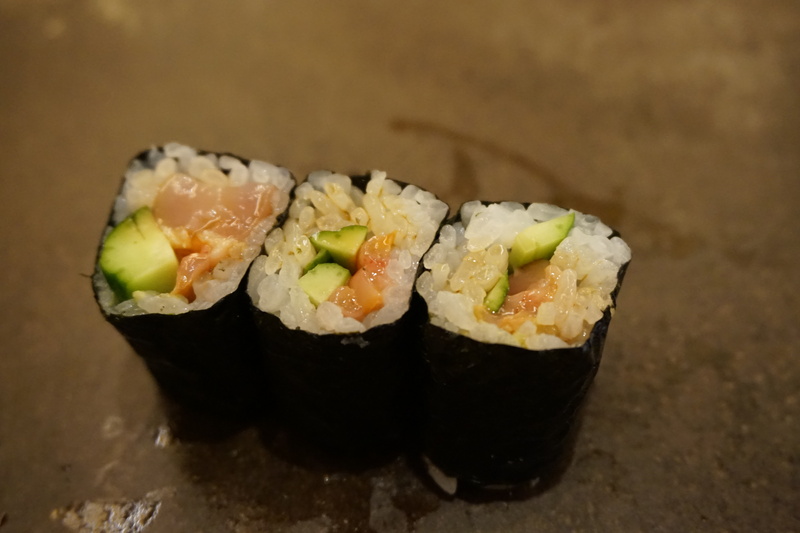 Manten Sushi breaks that trend, however. 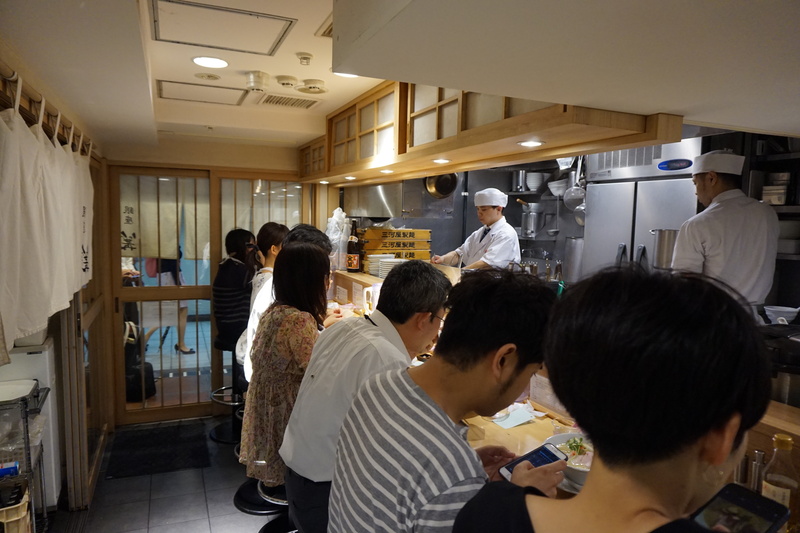 Located in the basement of Marunouchi Brick Square, it is without a doubt one of the best value set dinners available in all of Tokyo. 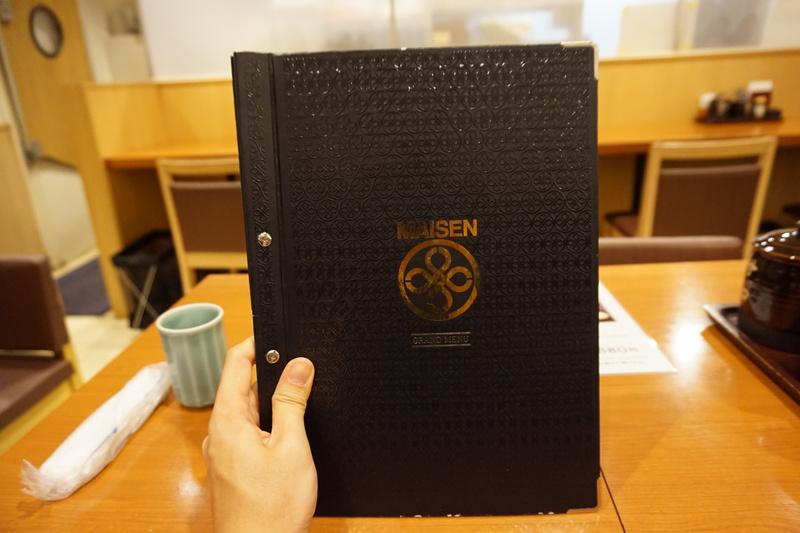 There is no menu. 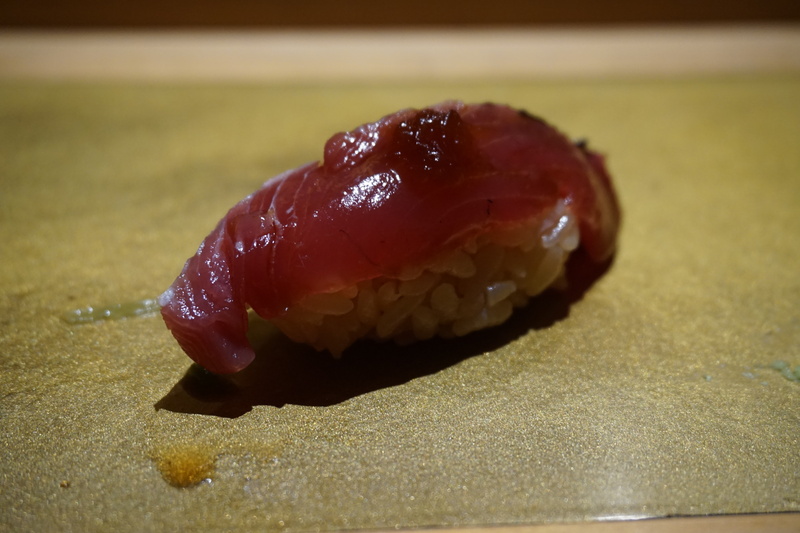 It is omakase at JPY 6,480/S$80 per head. 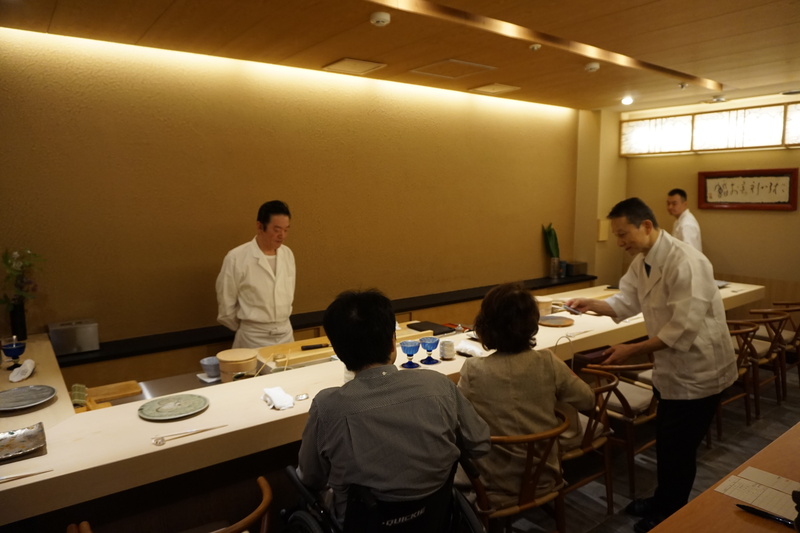 Reservations can be made online, and are essential. Don’t bother showing up and hoping for the best; there’s a big sign outside the restaurant saying “ALL SEATS ARE RESERVED”. 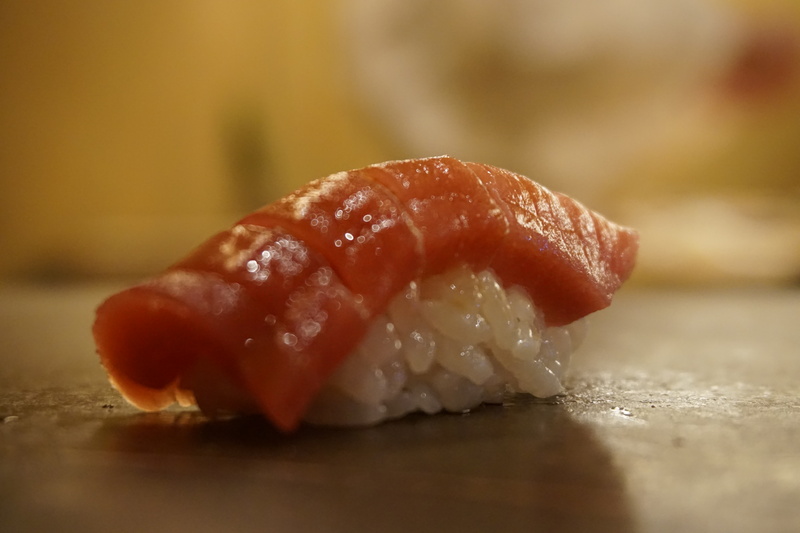 You won’t find this place on many “must visit” lists, and that’s a good thing. 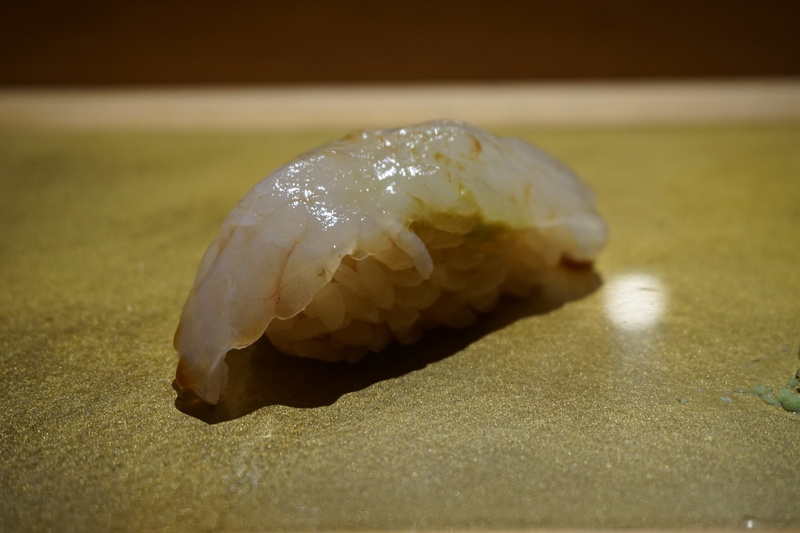 Tsubaki is a prime example of how a Japanese sushi place doesn’t need to be mentioned in Conde Nast or Tripadvisor to be good. 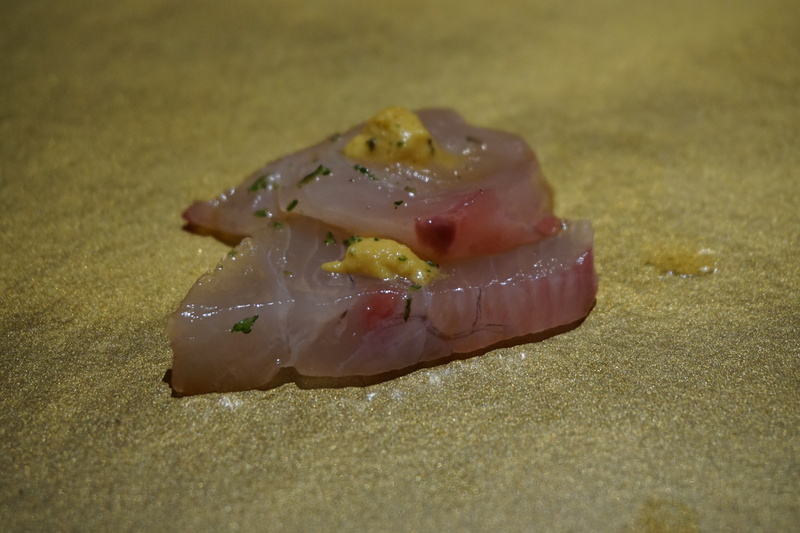 It’s a lesson on how a hole in the wall place will still have excellent quality fish and a chef who knows how to prepare it. 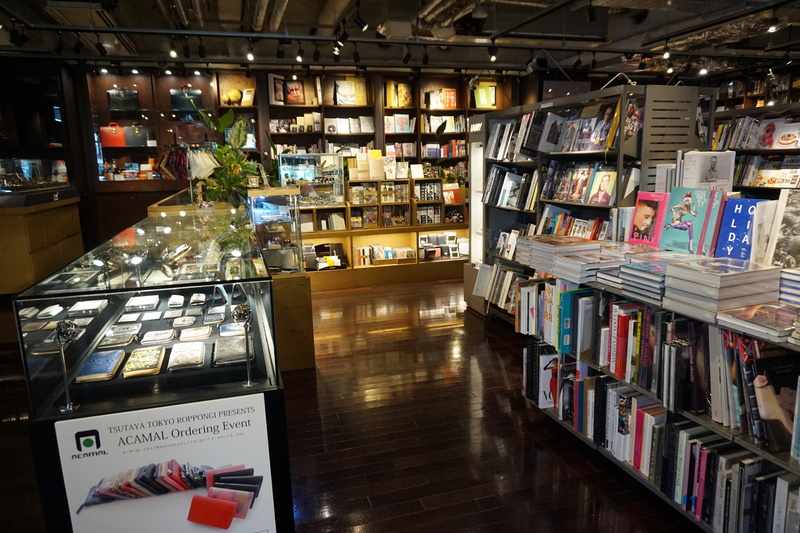 The shop is hidden away on one of the side streets in Ginza, and I’ve forgotten how I even discovered it. 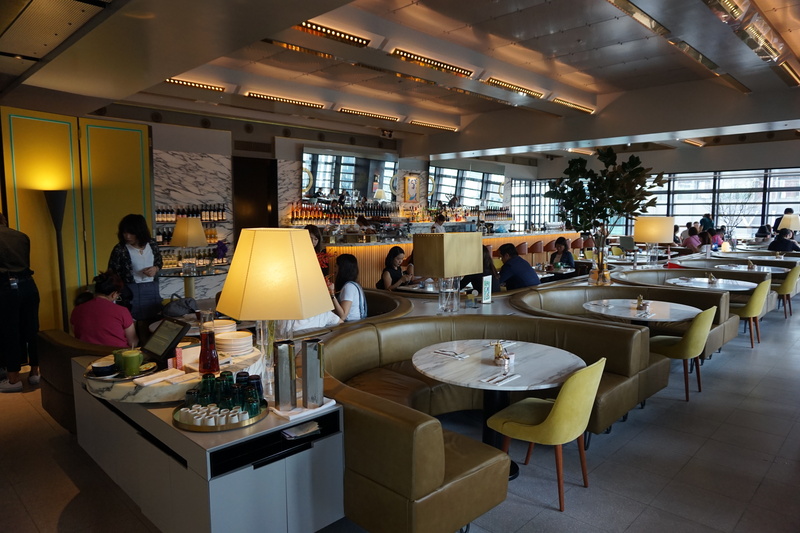 But it takes reservations from a credit card concierge (some restaurants will only accept reservations made by hotel concierges) so long as you’re willing to provide your credit card number as security against a no-show. 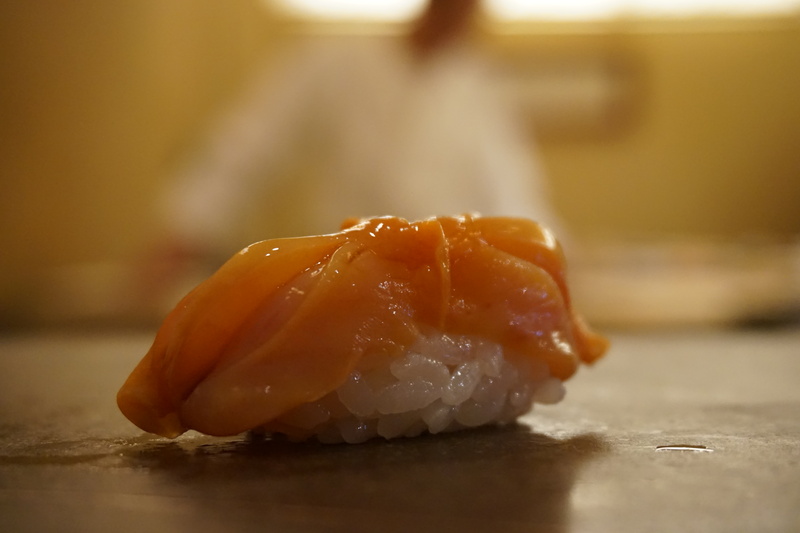 Come to this place for lunch (dinner is significantly more expensive). 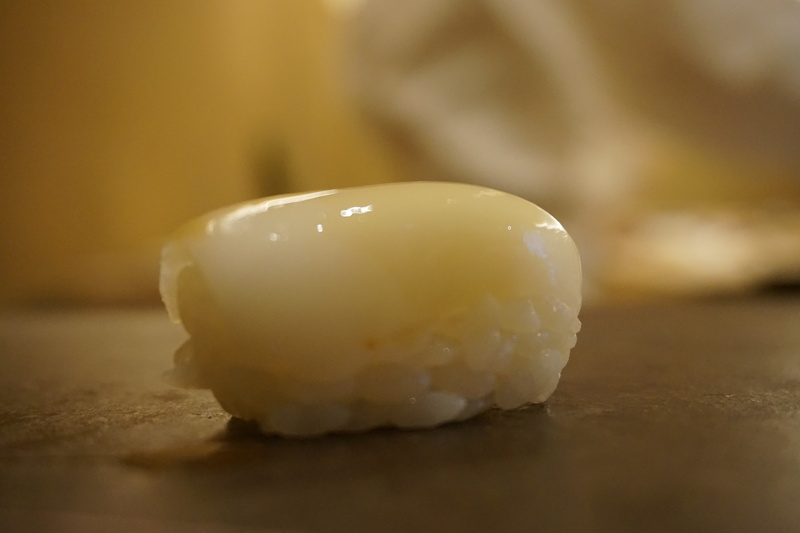 For JPY 5,400/S$69, you’ll enjoy 10 pieces of nigiri, plus a roll, plus dessert. 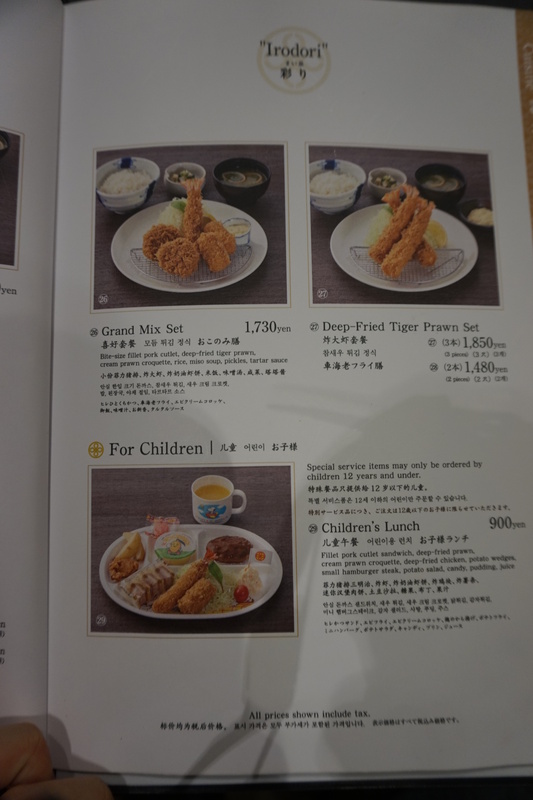 There are also larger sets you can order if you’re more hungry, all of which are still great value. 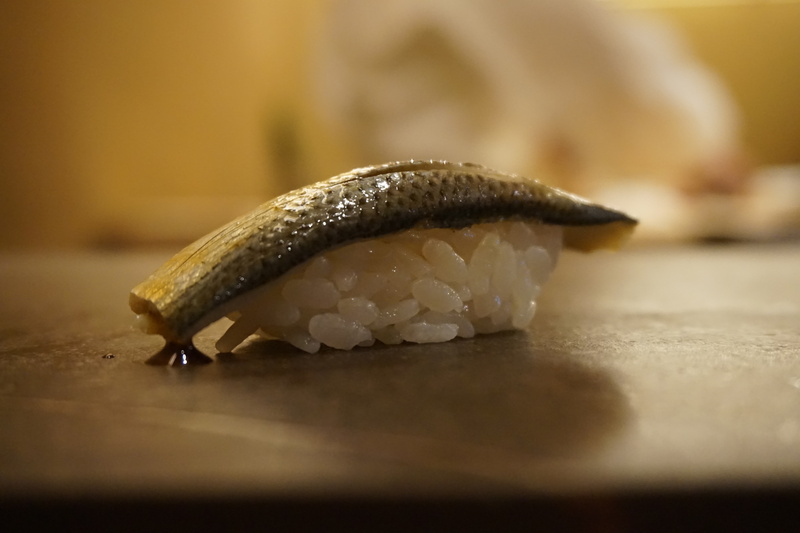 The fish is market-fresh and the rice blend they use has the perfect texture and acidity. 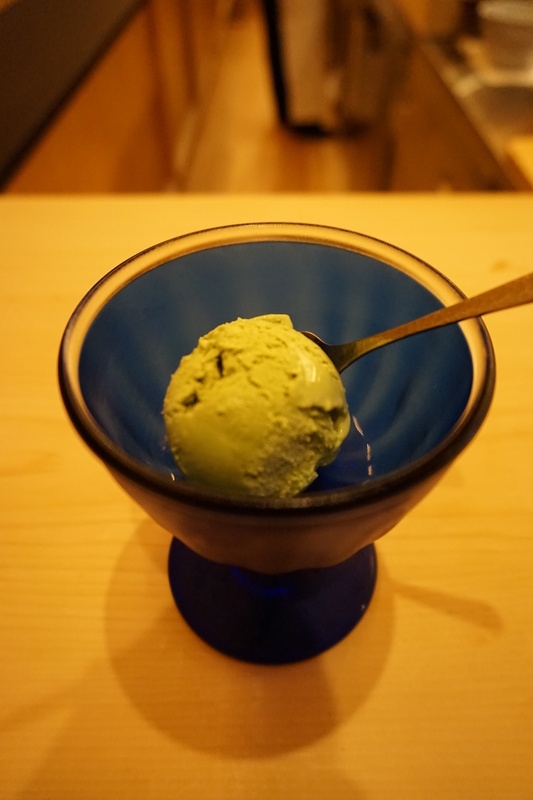 There’s even dessert waiting for you at the end of the rainbow with a choice of red bean or green tea ice cream. 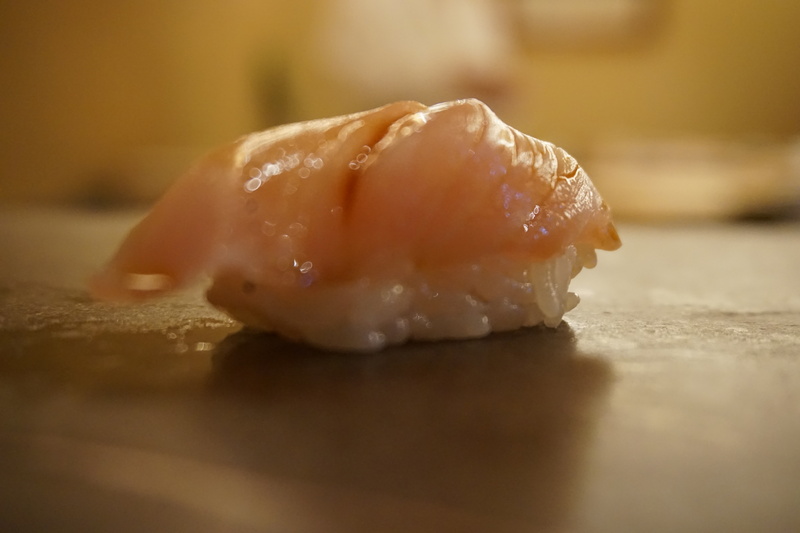 The owner of Tsubaki is one of the nicest people I’ve ever met. He makes the effort to converse with you in what little English he knows, he actively encourages you to take photos of the food (unlike other Japanese restaurants where you have to hide your camera and take stealth shots) and the last time I visited, it was raining and he gave me an umbrella to take home. 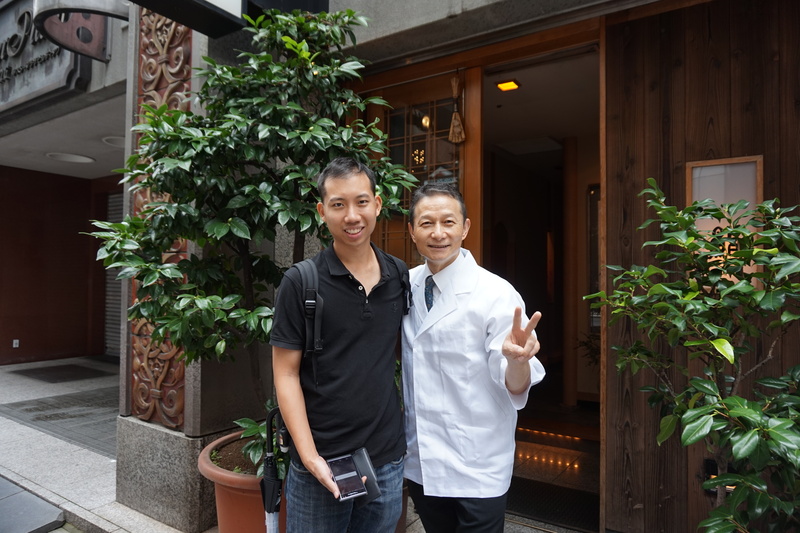 I was delighted to get the chance to visit his restaurant again. 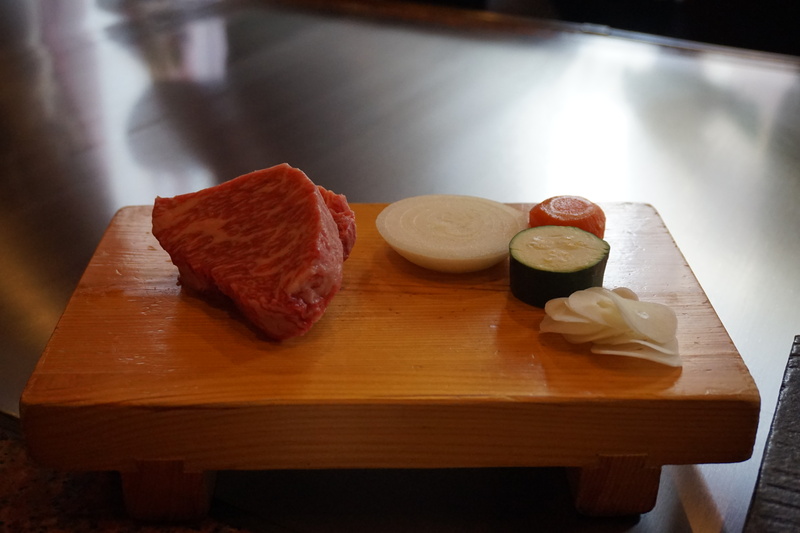 Japanese beef is universally renowned and there are many ways of enjoying it. 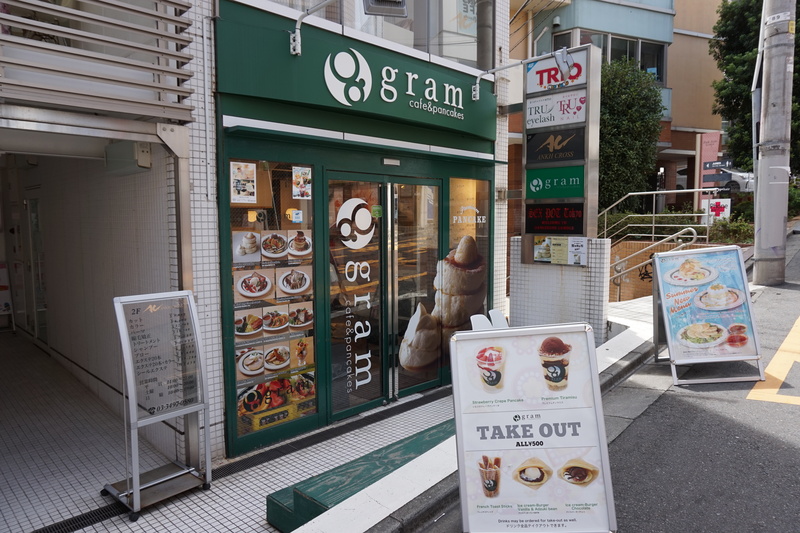 I went with restaurants specializing in teppanyaki, but if you’re looking for sukiyaki/shabu-shabu/gyu-don, the internet is your friend. 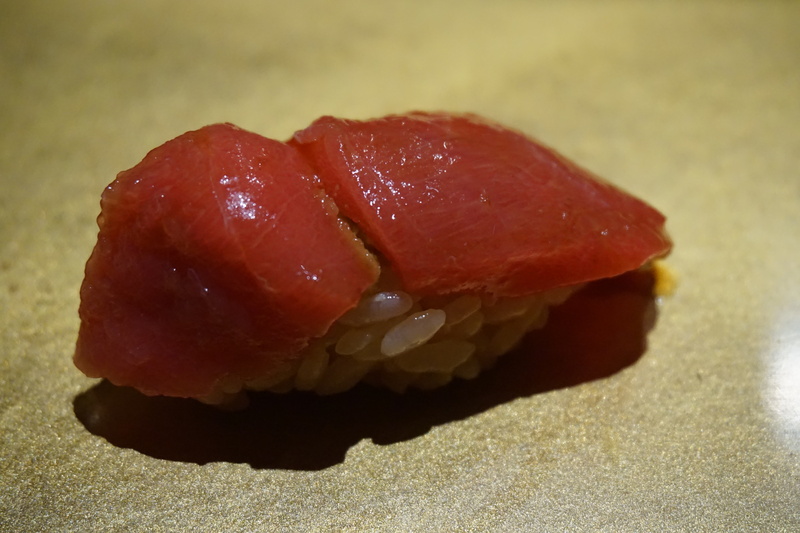 I was jonesing for beef by the third day of my trip and had booked two different places, which turned out to give me two very different experiences. 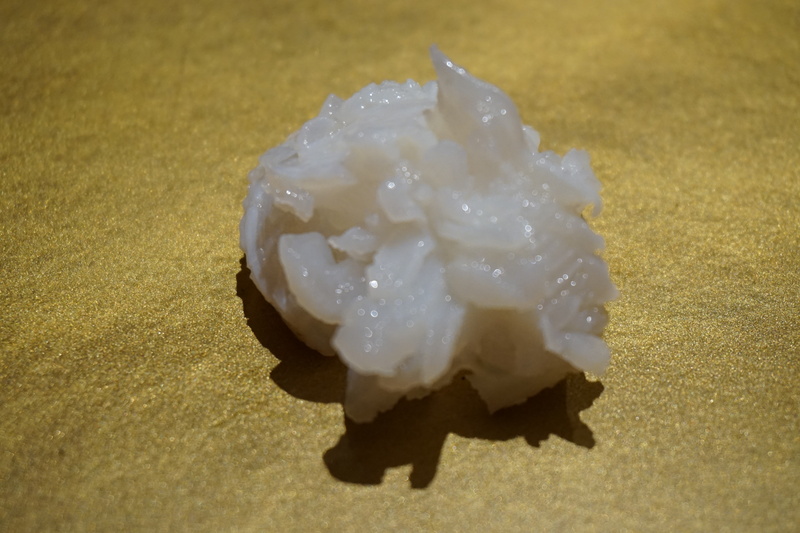 The first was Ukai-tei. 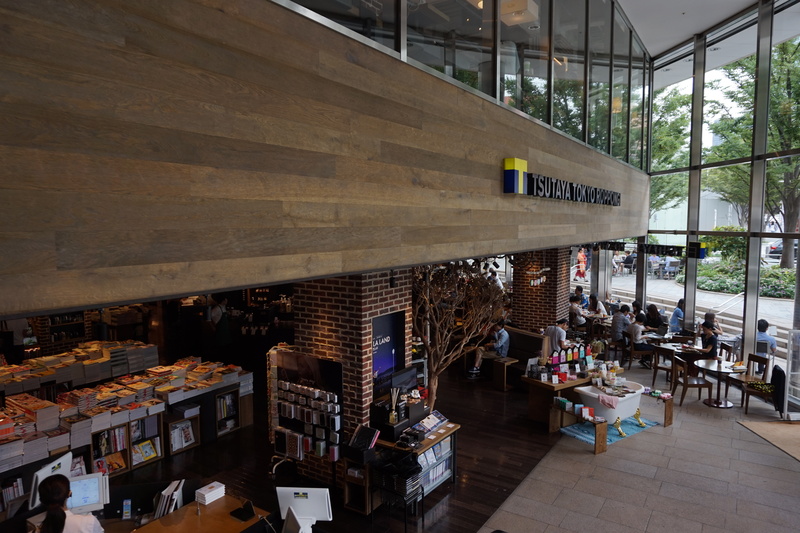 There are several locations, but I opted for Omotesando. 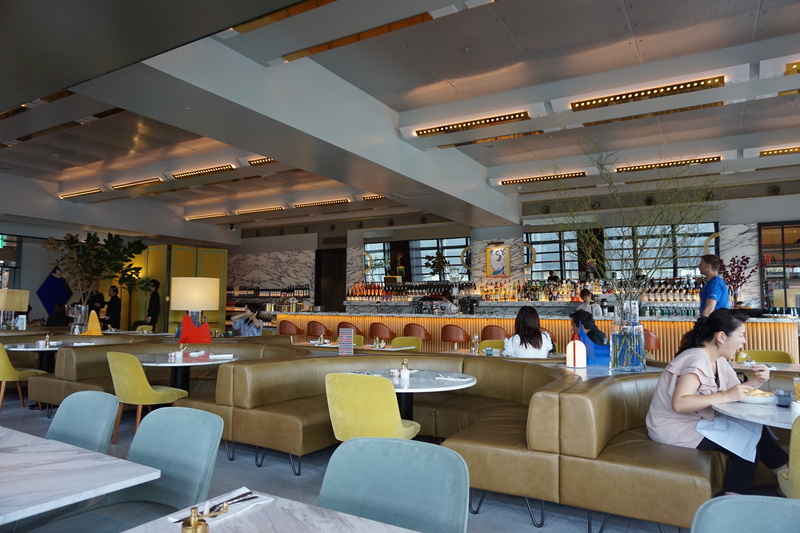 Making a reservation was easier than I thought- I just called them with Skype and an English speaking associate took my reservation and sent me a confirmation email. No drama, no credit card required. 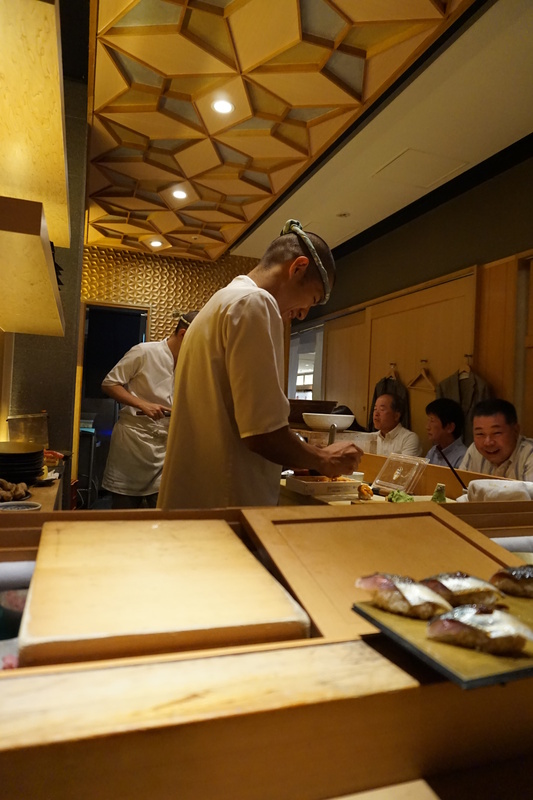 Ukai-tei is all about the experience- from the time you arrive you get the sense that this is unlike any teppanyaki place you’ve been to. You’re greeted at the door and brought to a small reception area where a cold drink is served while your table is prepared. 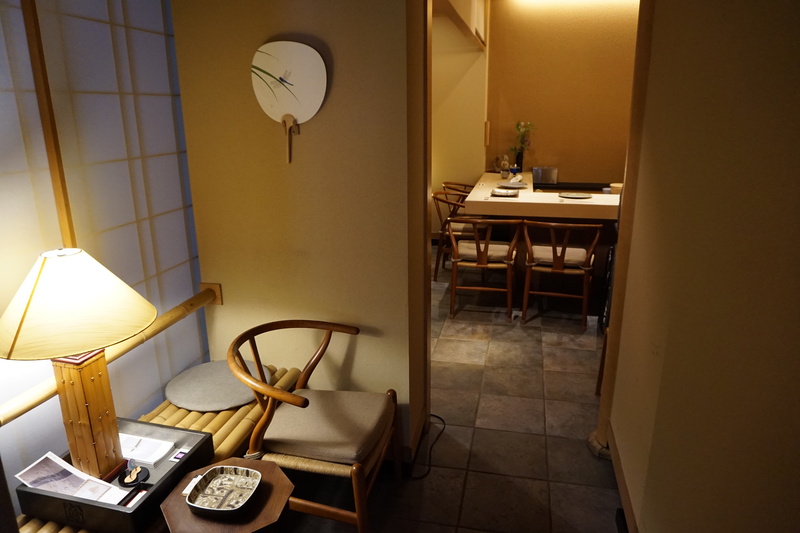 I love how seasoned Japanese hosts are- even without asking they have an uncanny way of knowing who you are when you show up, so long as you’ve made a reservation. 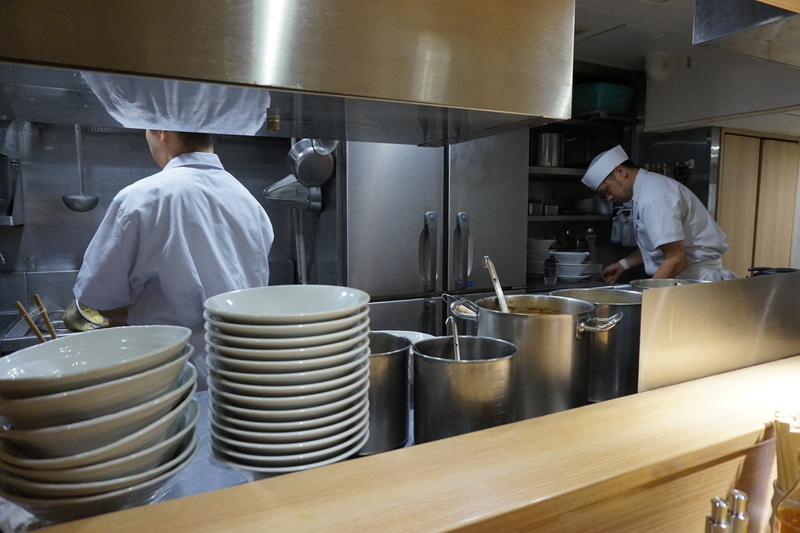 Once that’s done you’re ushered into the inner sanctum with the teppan. 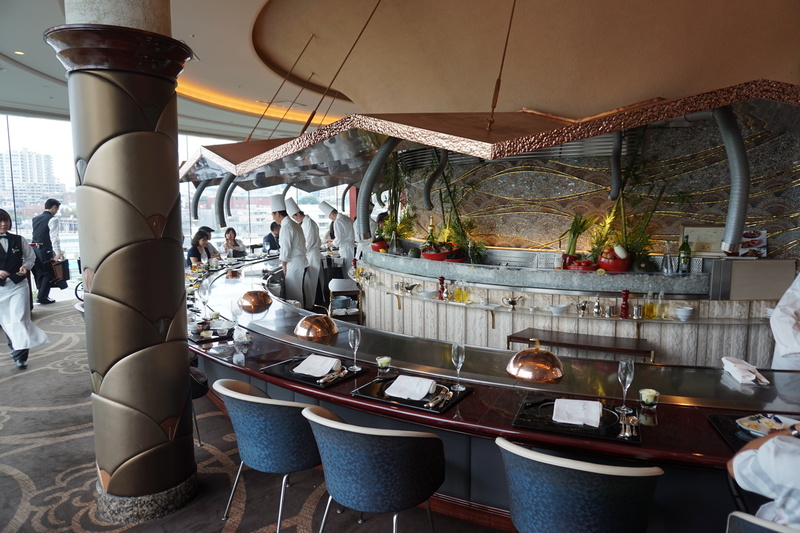 You’re seated and your personal chef comes to introduce himself to you. 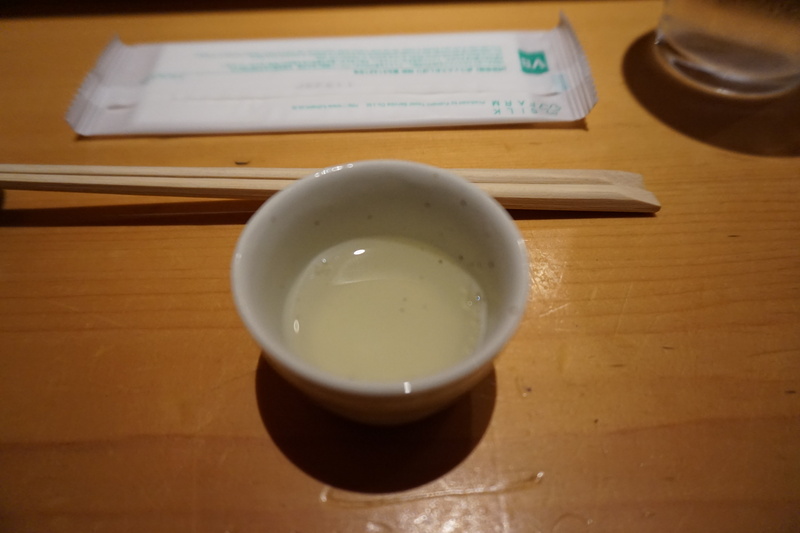 A hot towel appears, your water glass is filled and the menu is presented. 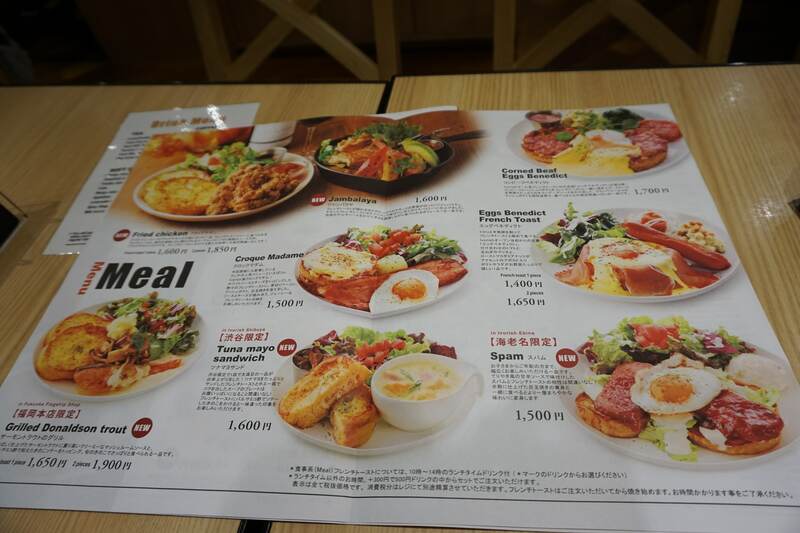 There were three options for lunch priced at JPY 7,020/9,720/12960 (S$87/120/160/). 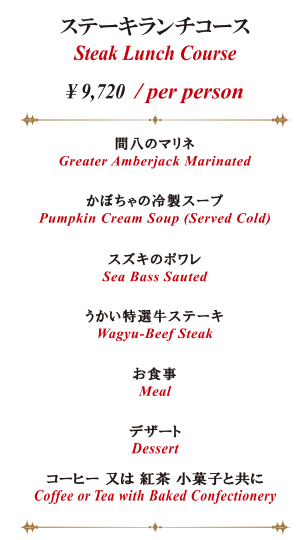 I went with the middle option that added some fish to the beef. Everything ran like a wonderful symphony after I ordered. 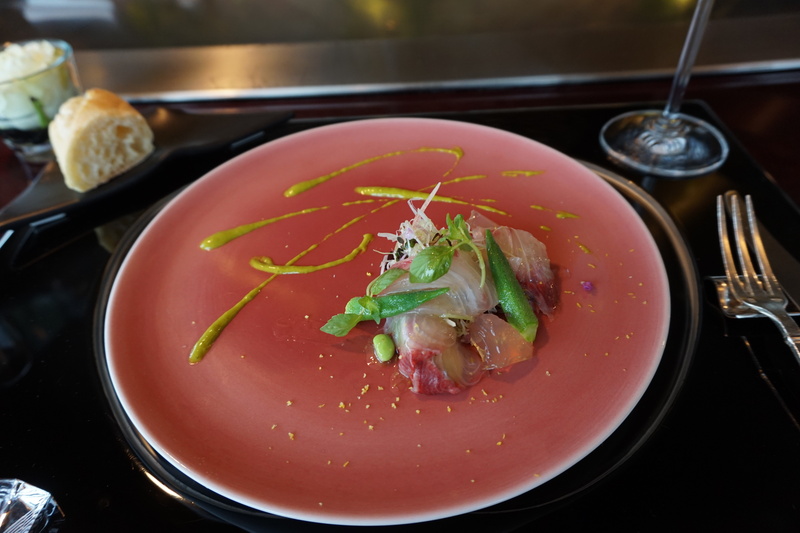 The first course of amberjack was plated beautifully (beautiful plating would be a recurring theme throughout all the courses) and served in a raw sashimi style, but with some fresh greens and a delicious avocado (?) sauce drizzled on the plate. 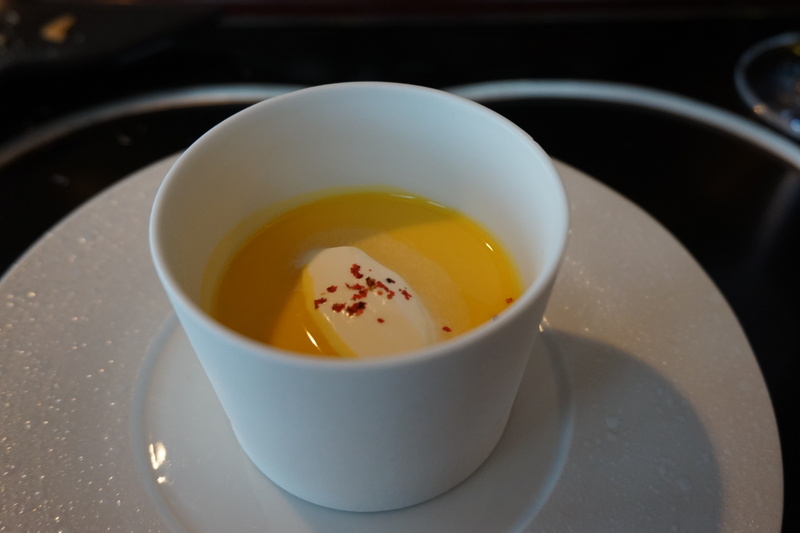 Next up was cream of pumpkin soup, served chilled. I don’t really like eating pumpkin. I find it tastes weird. But this pumpkin soup was something else altogether. 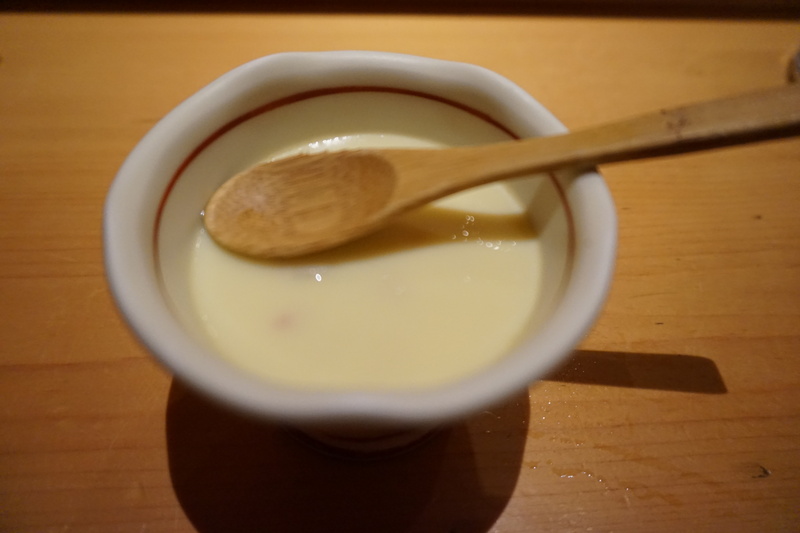 It was sweet and creamy and sinful all at the same time. 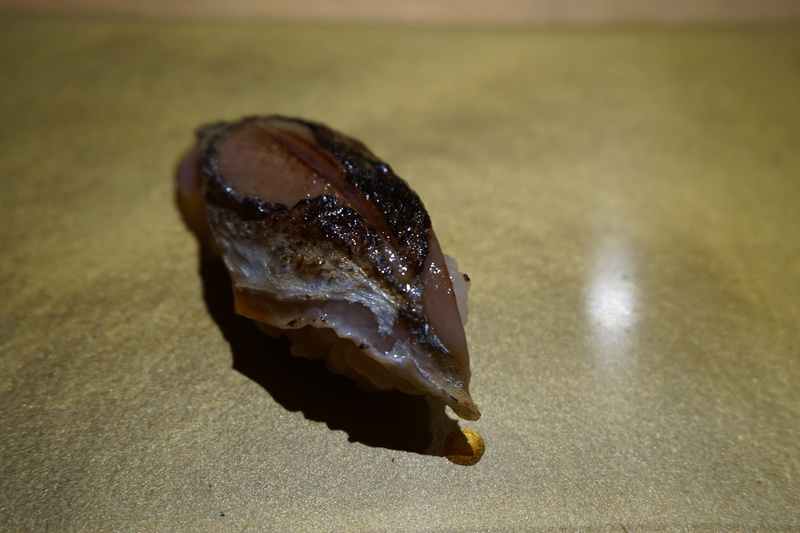 Yes, after a few mouthfuls it got too rich for me, but what an incredible few mouthfuls those were. 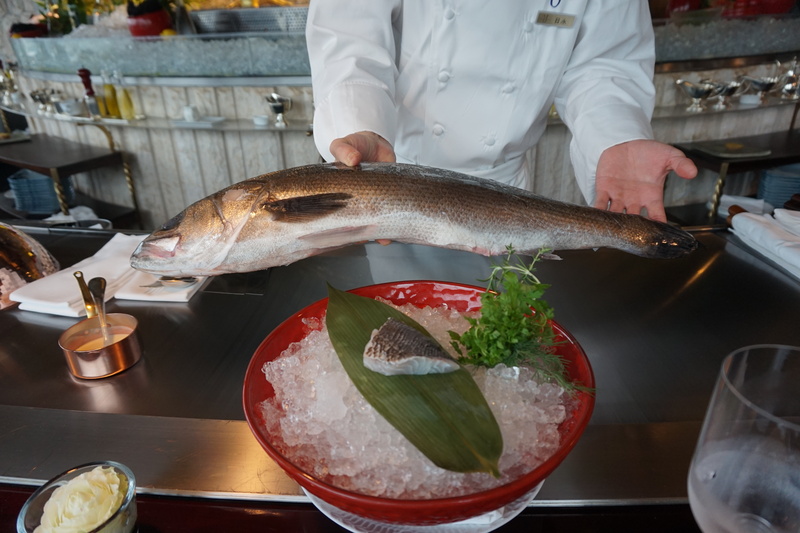 The chef (who was friendly, personable and trying his level best to explain each course to me in broken English) then placed the sea bass infront of me, before going to fetch the entire fish as if to remind me where it came from. 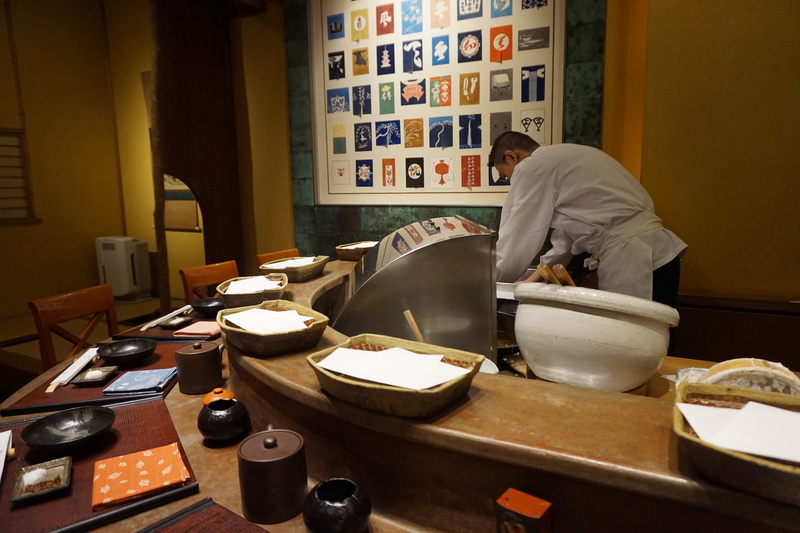 His movements with the teppan were like poetry in motion, with a very precise way of keeping his cooking station clean. Every stray fleck of oil was corralled into a corner and disposed of. 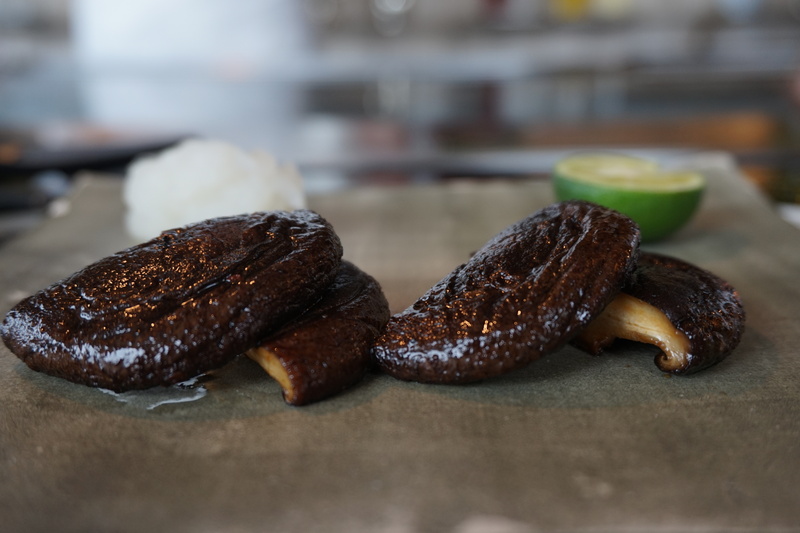 Every charred bit was dutifully removed. The food and oil were like playdoh in his hands. 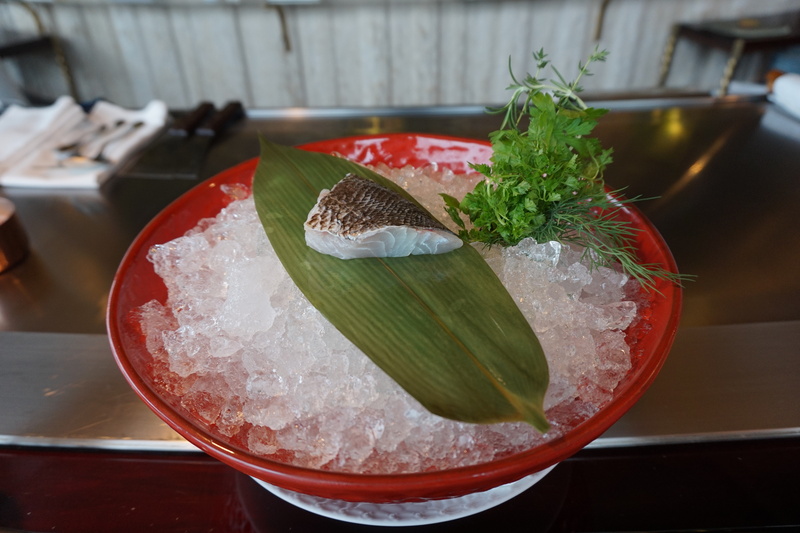 After the fish and potato had seared for a while, out came some herbs which were lavishly strewn across the smoking teppan, releasing their goodness before being chased into the corner under the chef’s ever present watch. 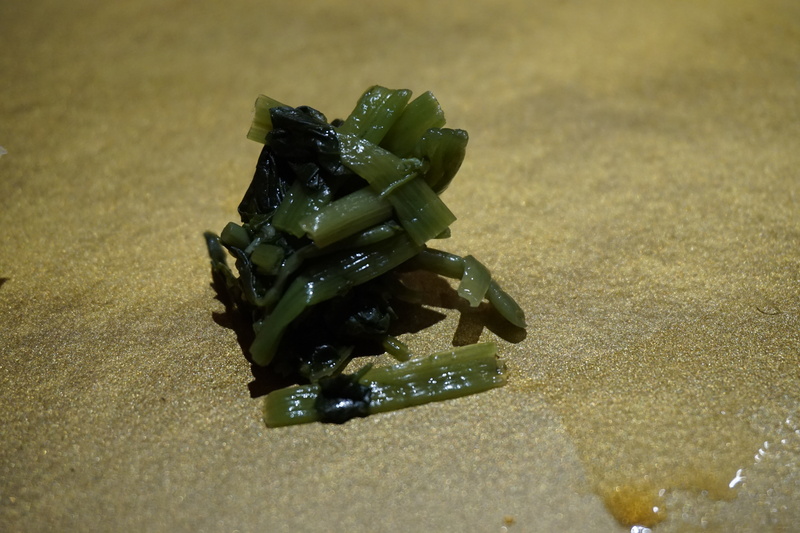 These were disposed of and not served with the dish. 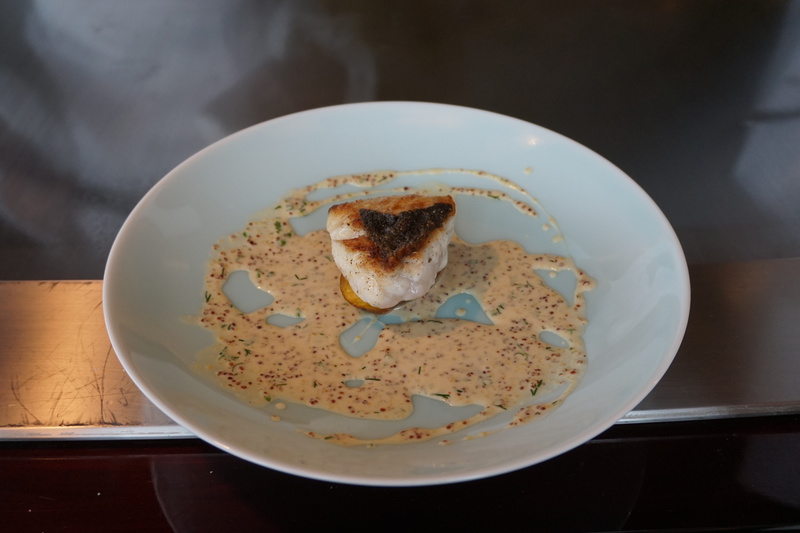 As the fish finished cooking, the chef put together a sauce made of mustard and peppercorns. 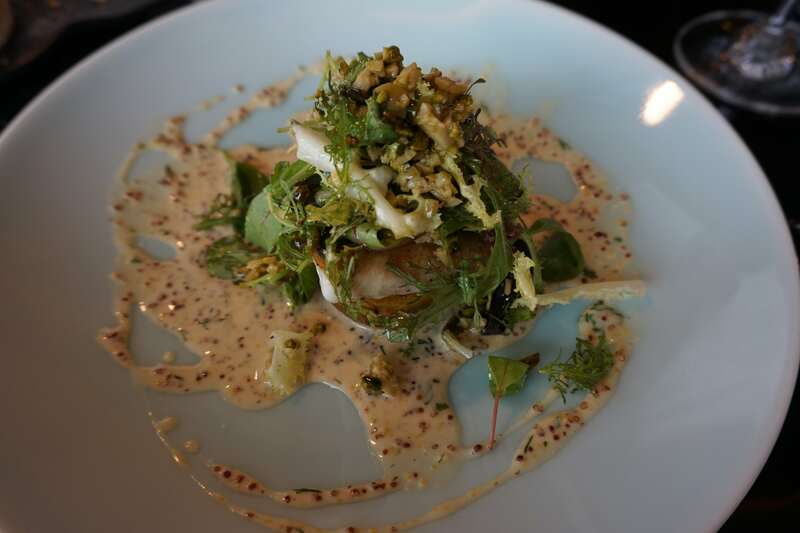 He also started mixing together a salad of mixed greens and pistachios. 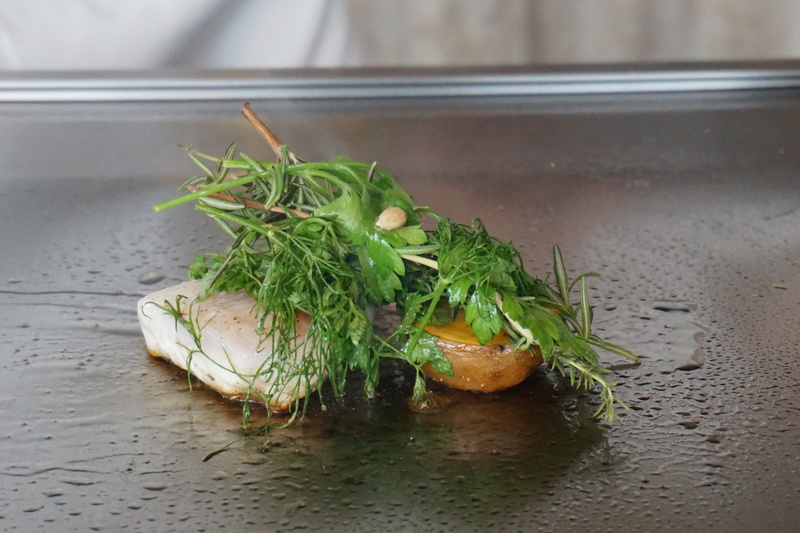 And then started to assemble the dish infront of me. 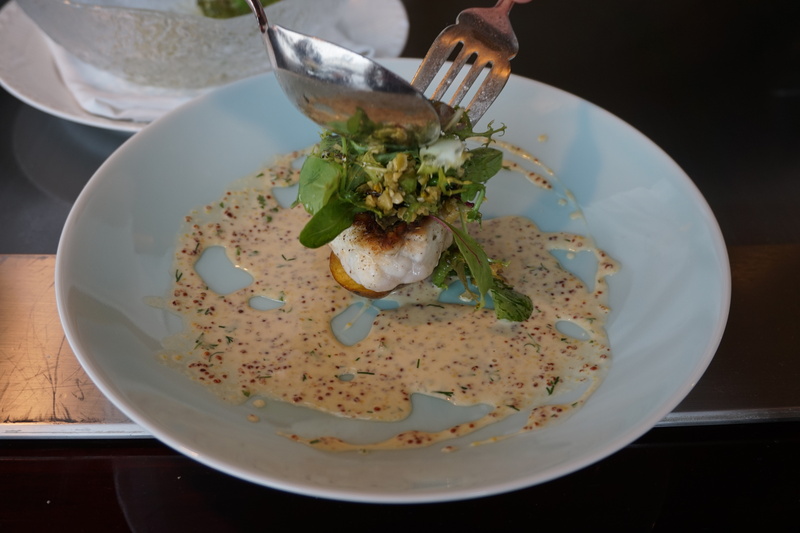 The fish was delectable with a strong sear on the skin and a cloying moistness within, and the salad and sauce were the perfect complement. 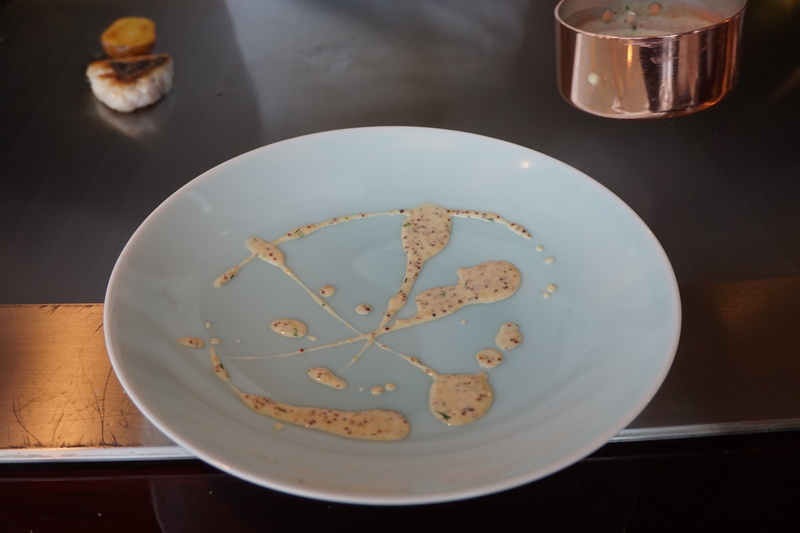 The crispness of late summer vegetables blended with the bite in the mustard sauce. 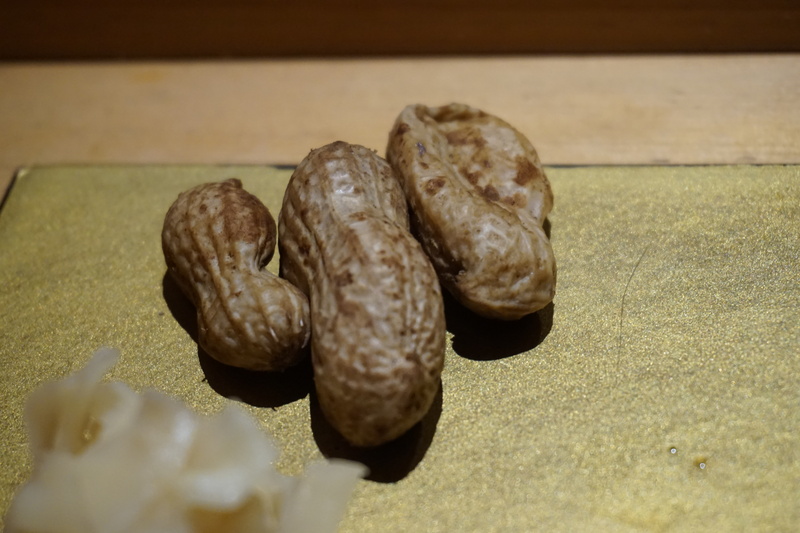 My shiitake mushrooms (not part of the set, ordered separately) were next. 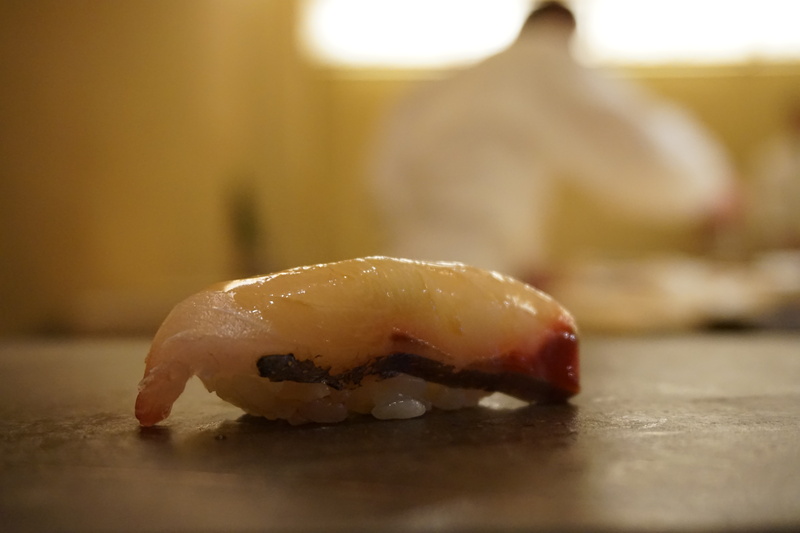 These too were sliced into perfect semicircles, salted lightly and caressed in the teppan until they came out plump and meaty. 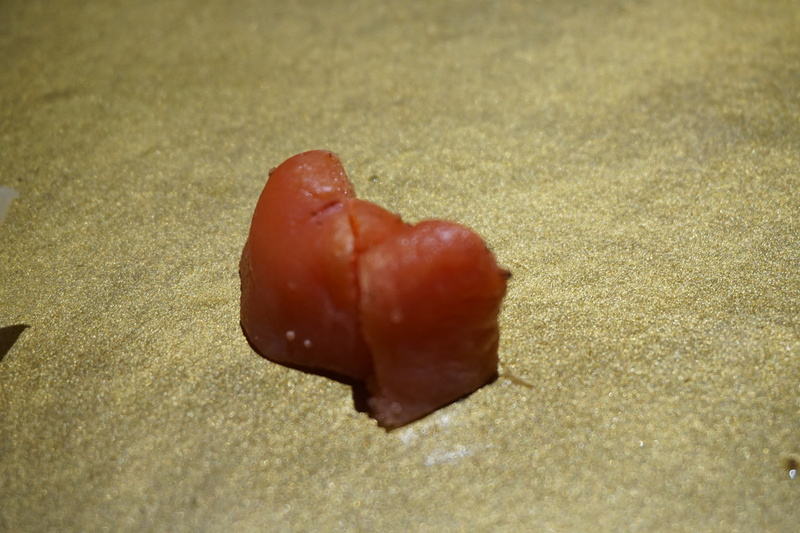 The star of the show had been hiding till now but finally she emerged, blushing bright red. 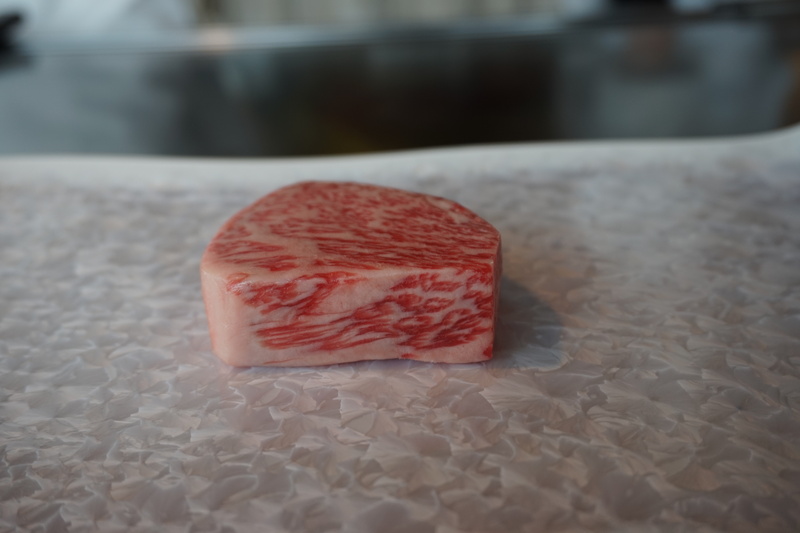 130 grams of Japanese beef, marbled to perfection. 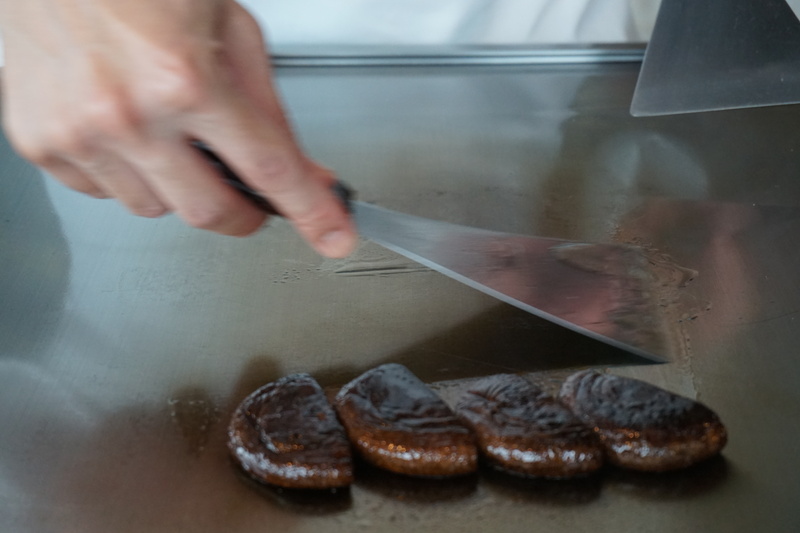 After a quick check of my doneness preference (the only acceptable answer is “medium rare”), the chef got to it, turning up the heat of the teppan to get that perfect sear. 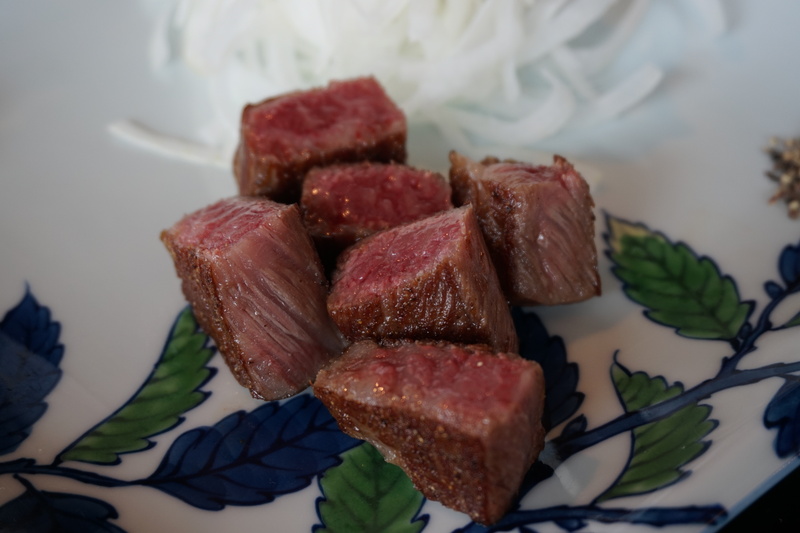 A few minutes later, the deed was done and the beef sliced into small cubes, with a side of fried garlic, peppercorns and white onion sliced so thin it was almost translucent. 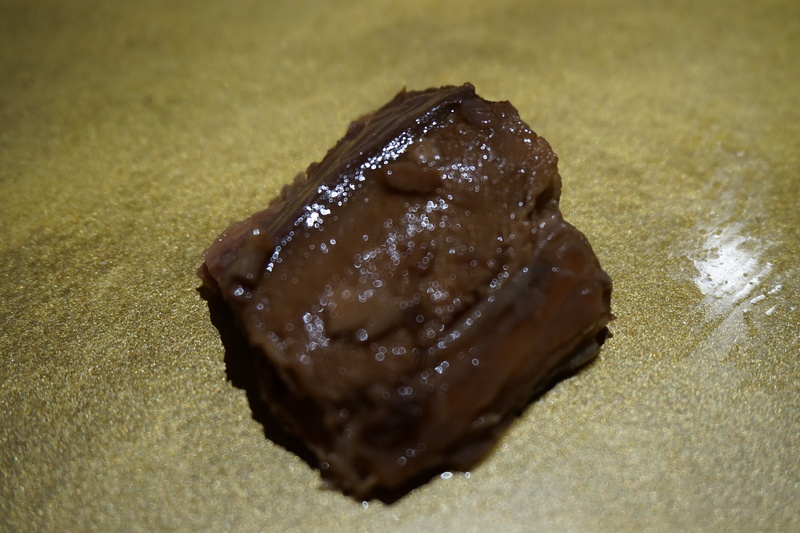 The beef was sheer bliss. 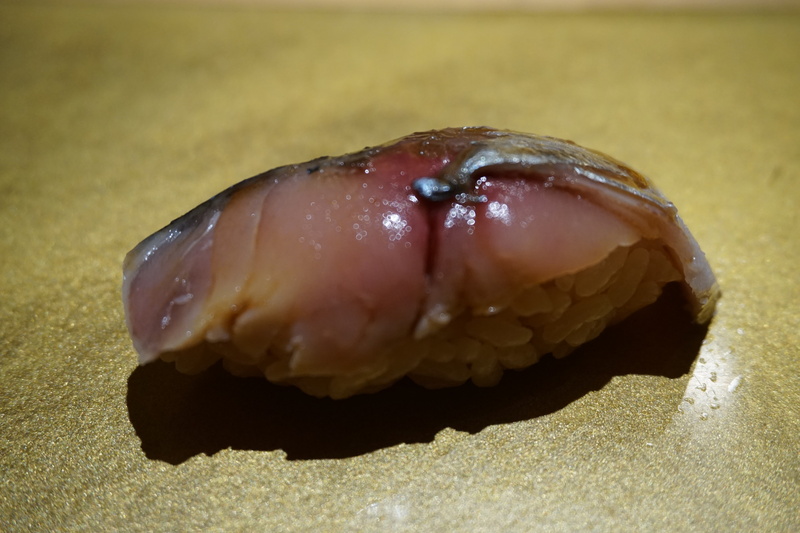 Charred on the outside, red on the inside with marbled fat hiding in every bite. 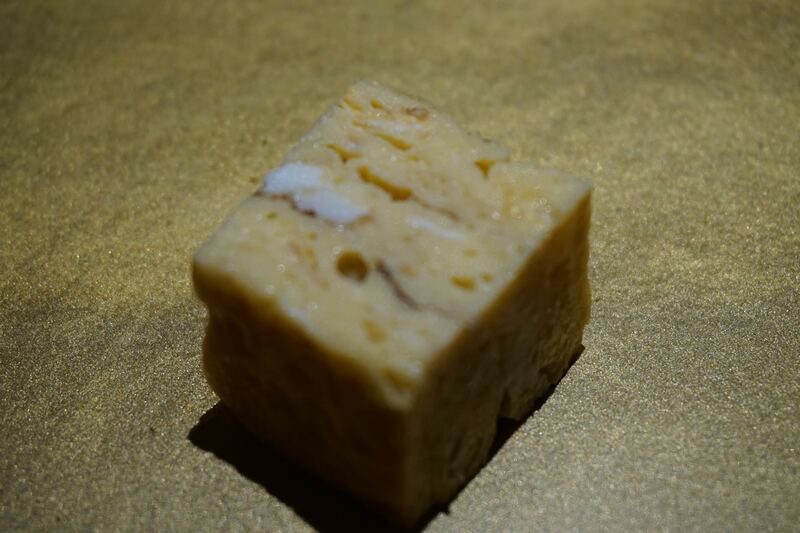 A dab of peppercorn, a sliver of garlic and onions and you mouth would be in places you didn’t know existed. 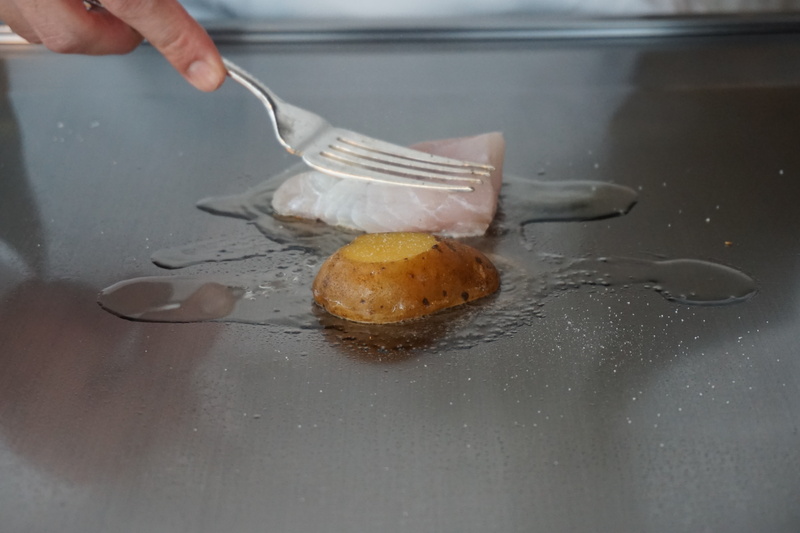 To wrap up the meal, he drizzled a bit of sauce on the teppan. It sizzled and smoked and eventually produced some charred bits. 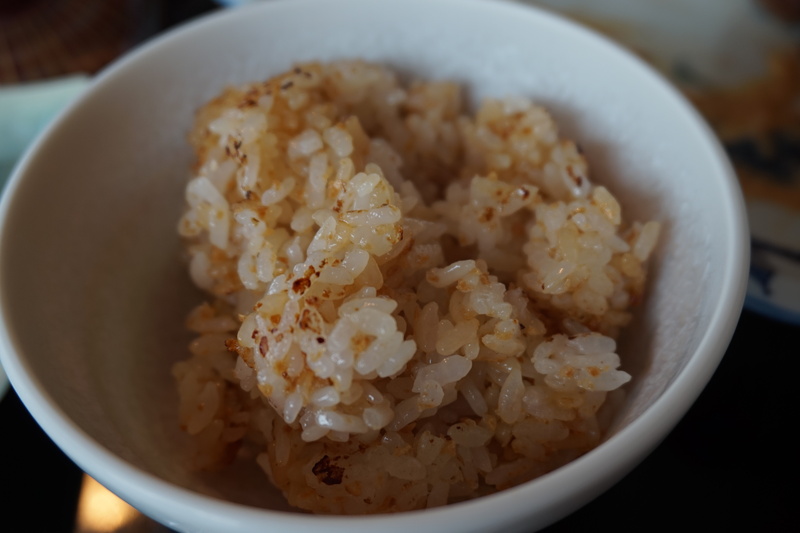 He then cooked some garlic fried rice and used these bits to dress the dish, giving a slight hint of bitterness. 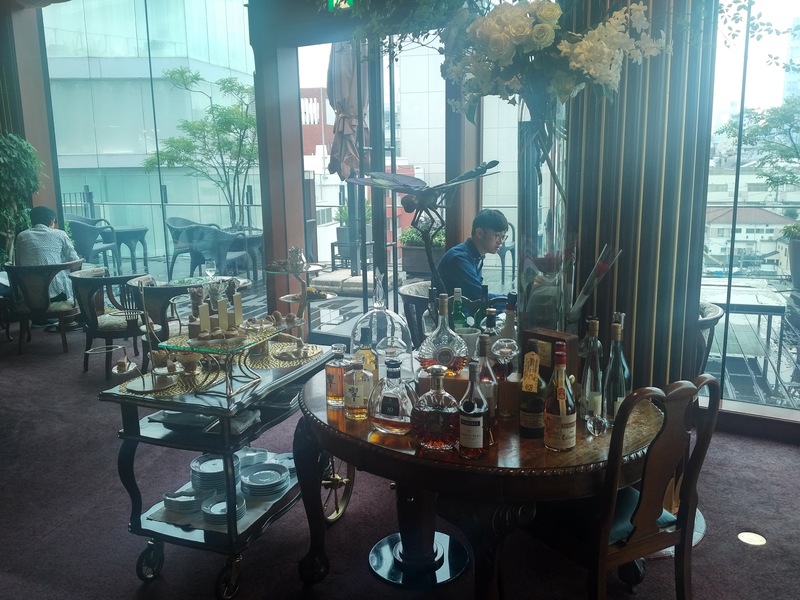 After the meal, an associate silently materializes at your shoulder, bending down and asking whether you’d like to retire to the parlor for dessert. 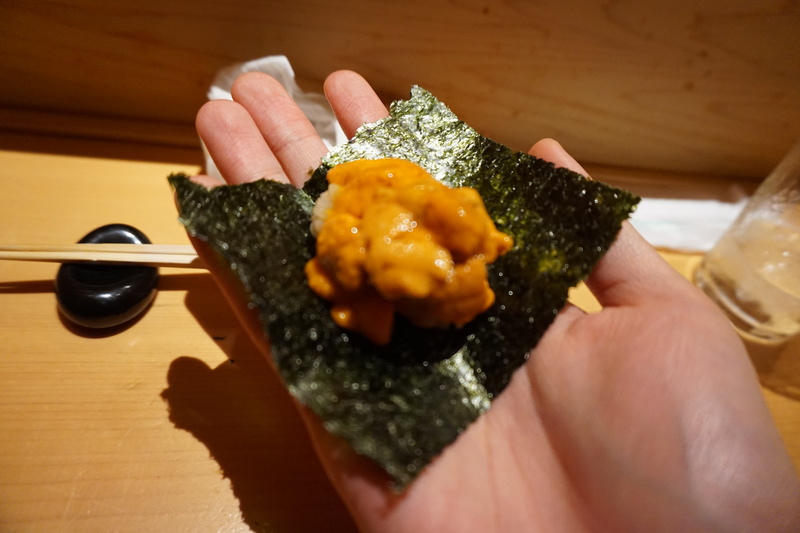 Yup, you’re being moved again to a separate part of the restaurant away from the teppan. Perhaps some of you like doing everything in one spot, but me? Loved the novelty of it. 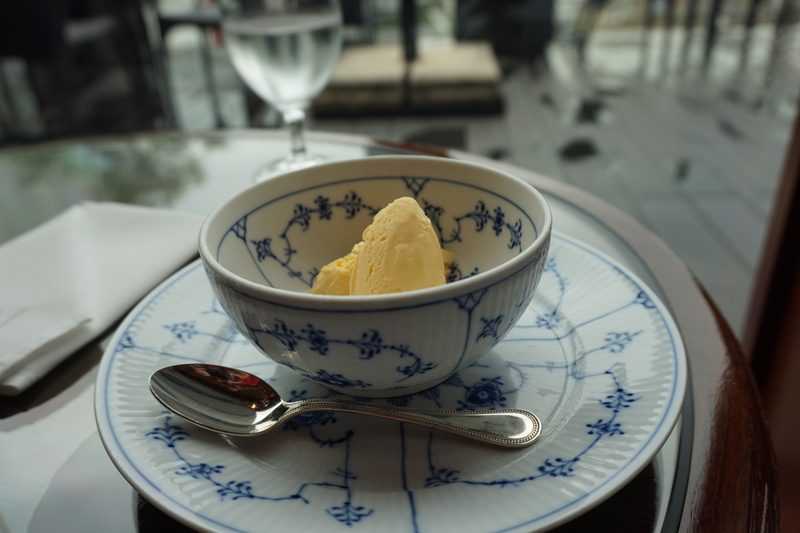 I had vanilla ice cream because vanilla ice cream. Although melon a la nage might have been a good call too. Done? Far from it. 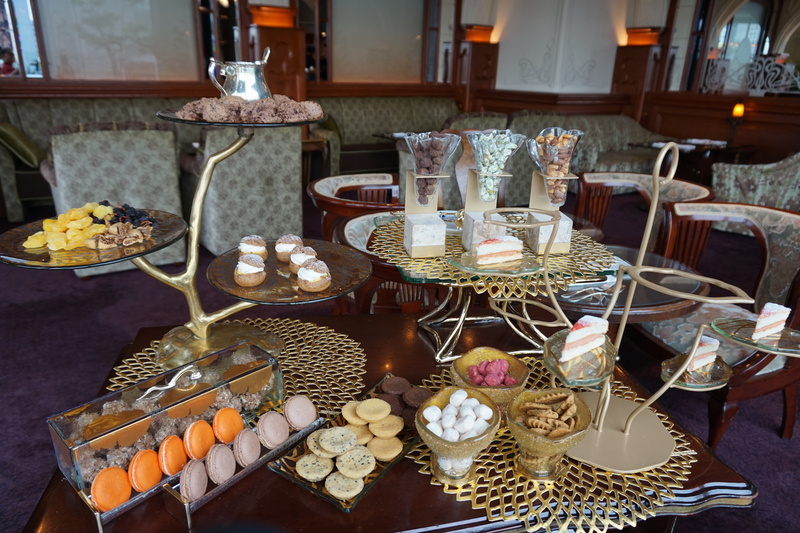 Along comes a cart with all sorts of small pastries, macrons and cookies to choose from. 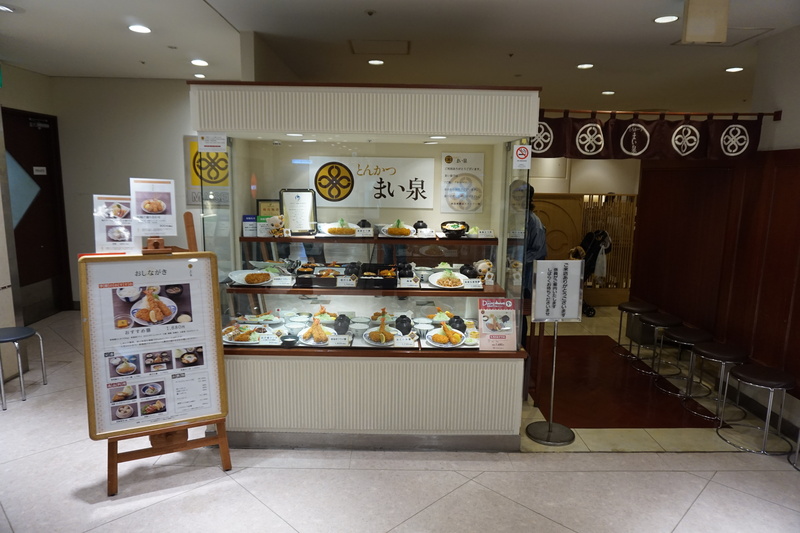 I had a scone, a cookie, some crispy rice and a profiterole, which was highly recommended by the staff. 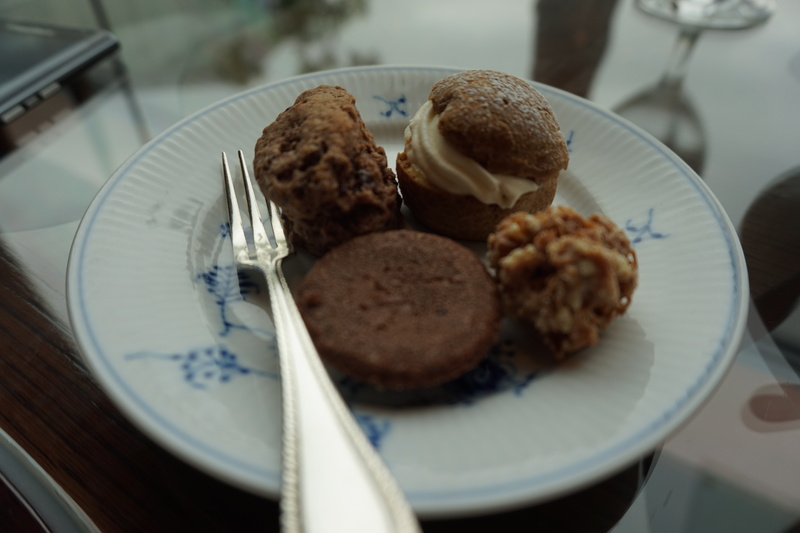 They were all delicious. I cannot emphasize enough how impressed I was by the entirety of the experience. 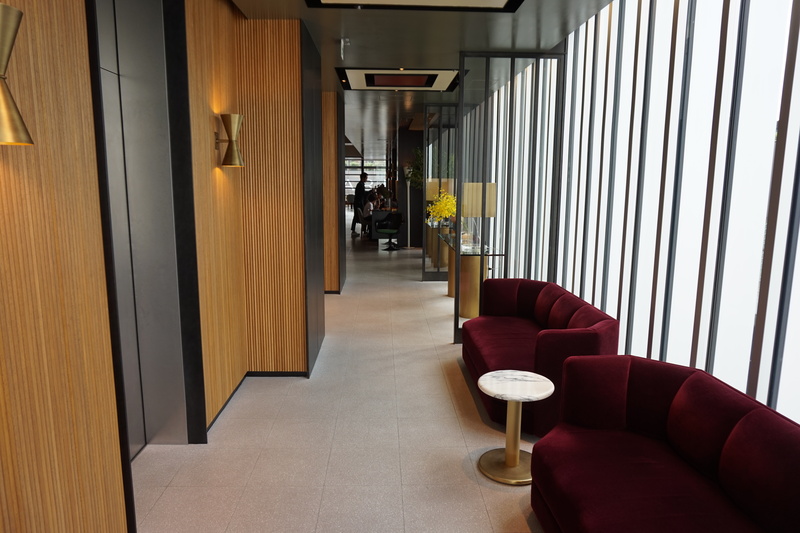 It would have been one thing if the food were mediocre, but the excellent food combined with the velvet gloved way I was handled made this a place I definitely want to revisit. 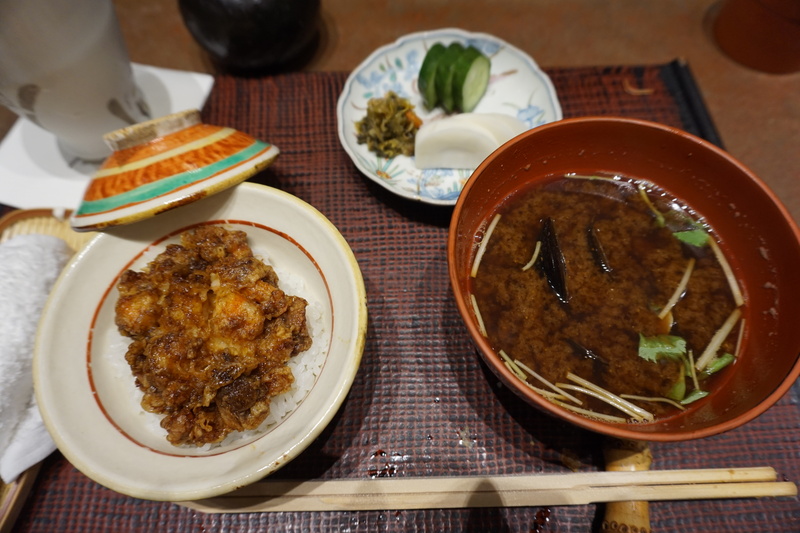 After the experience that was Ukai-tei, anything else was always going to be a disappointment. 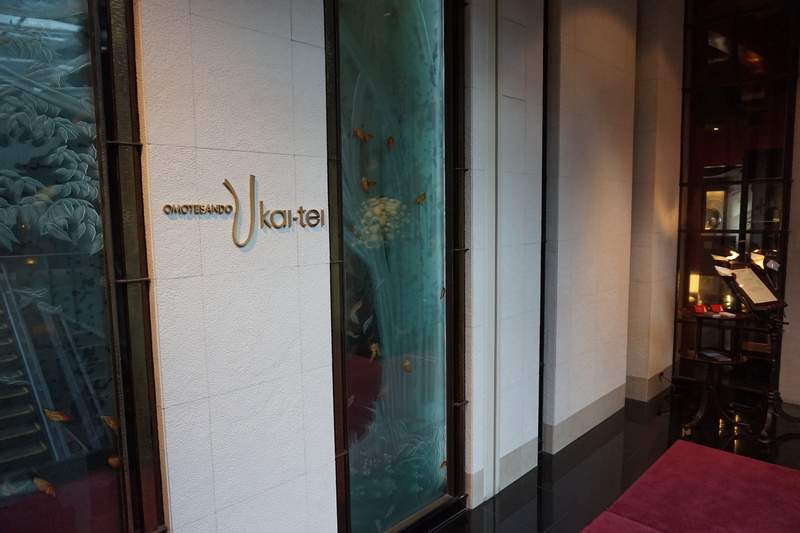 And maybe that’s a bit harsh, because the food at Bifteck Kawamura was superb. Exquisite. Other lofty adjective. 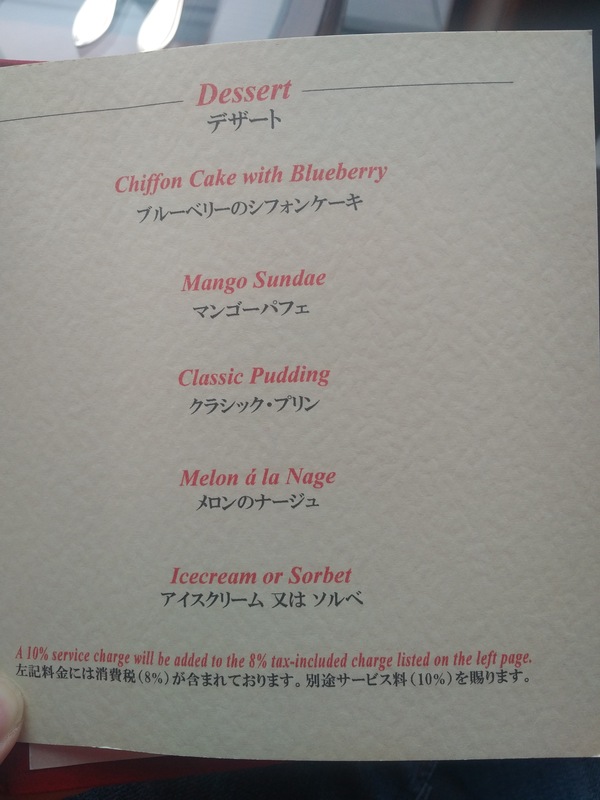 The service was great too. 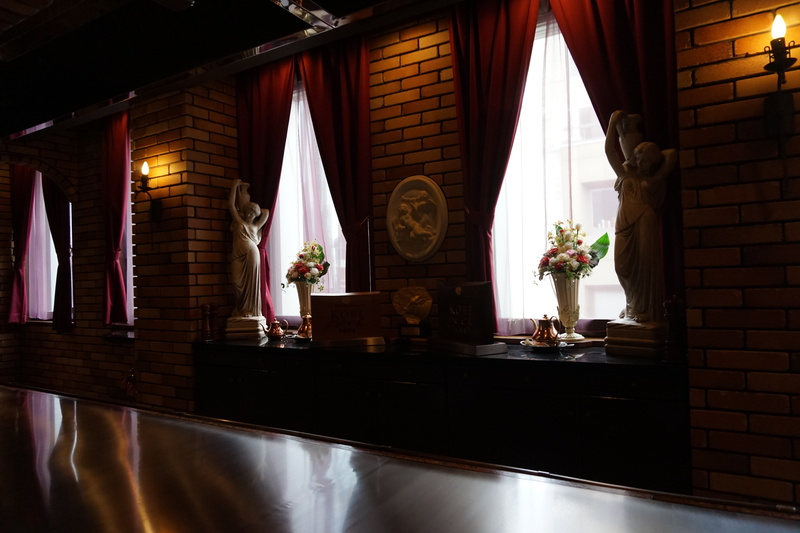 The ambiance was…dark. But still luxurious. 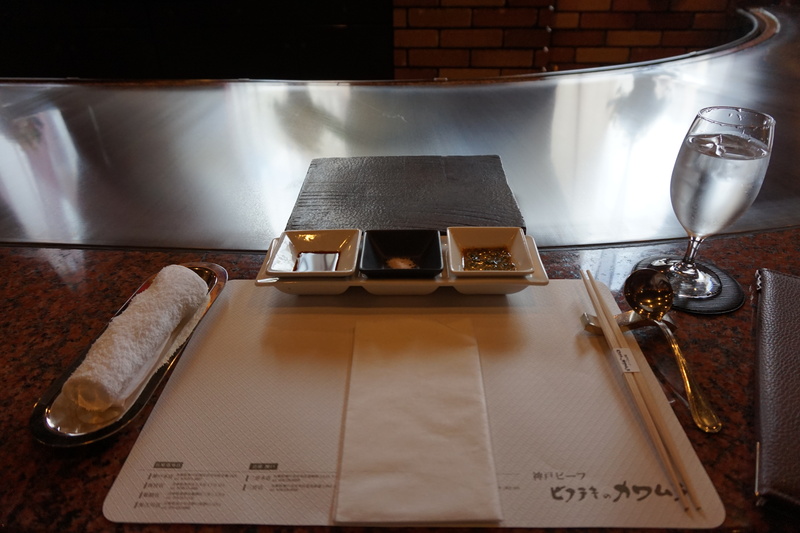 I was ushered to my spot on the teppan where a series of sauces were waiting. 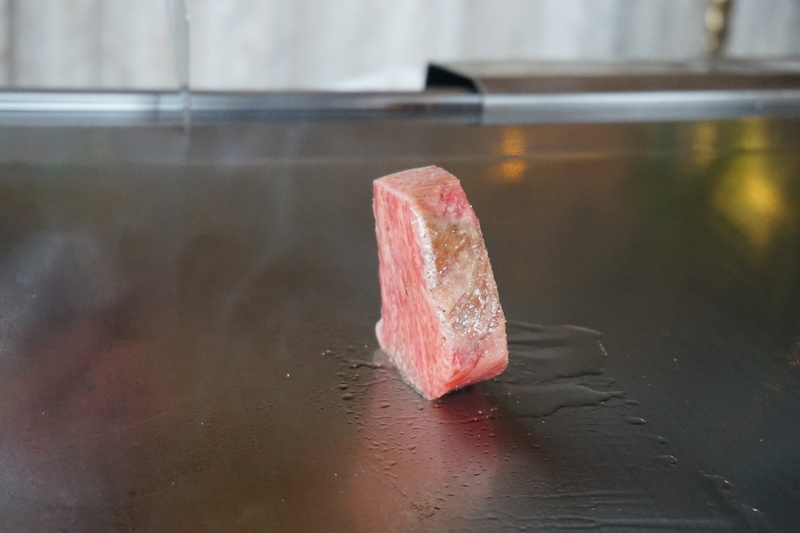 This restaurant specialises in Kobe beef. 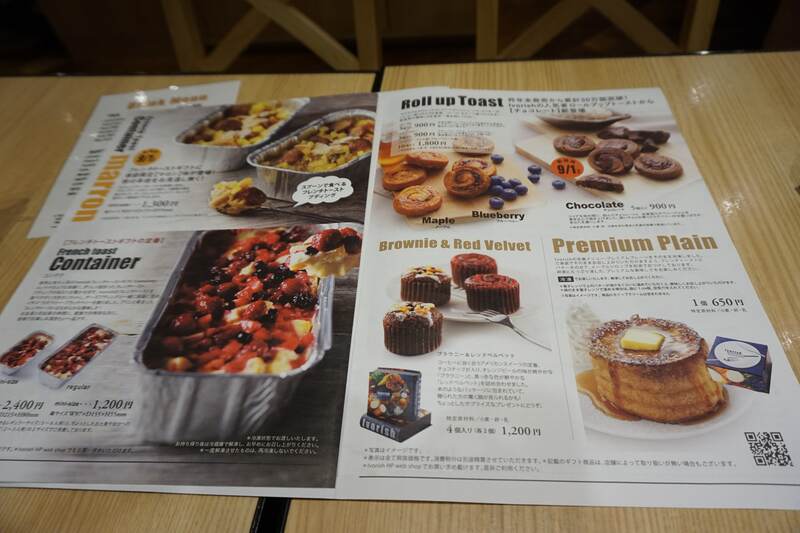 Here’s the full menu. 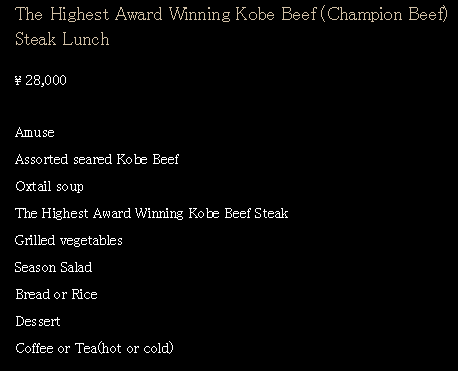 For lunch you could either go frugal or lavish. 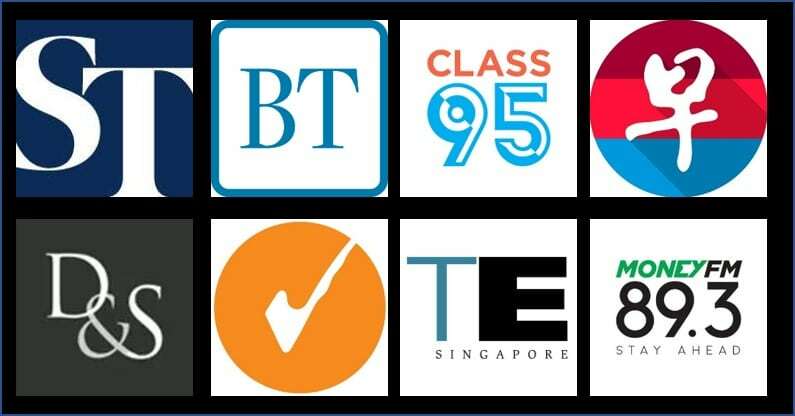 The cheapest set on offer is a mere S$43. 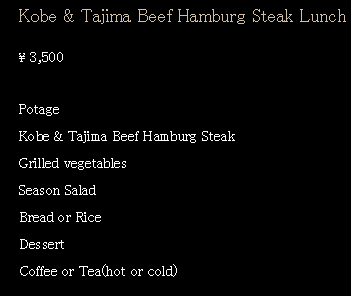 But do you really want to have hamburger meat, even if it’s Kobe? 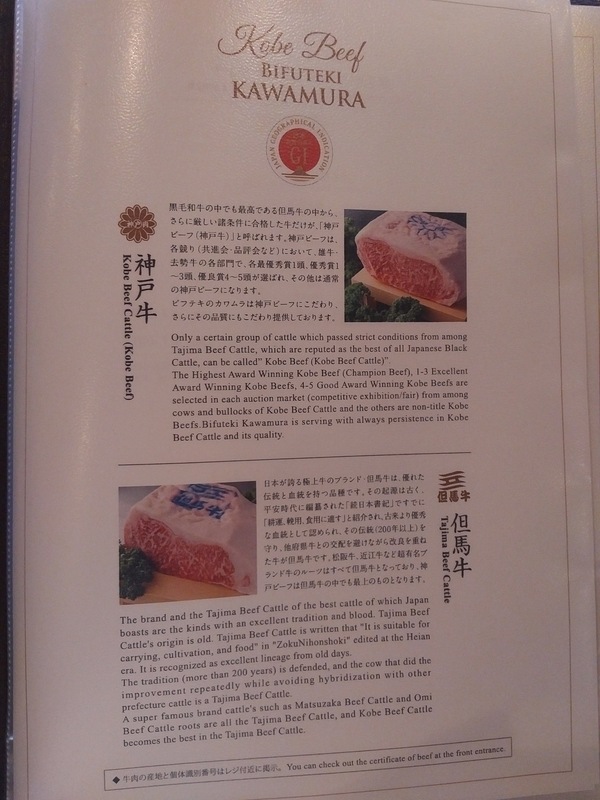 The most expensive would cost S$344, but the restaurant tells me it’s beef of the highest highest quality. 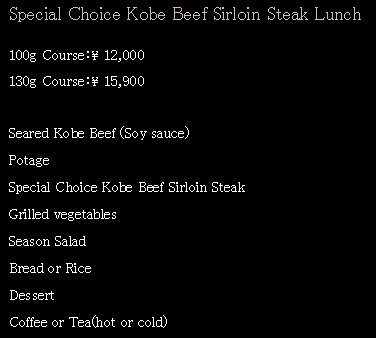 In the end I settled for 130gms of Kobe beef sirloin at S$195. 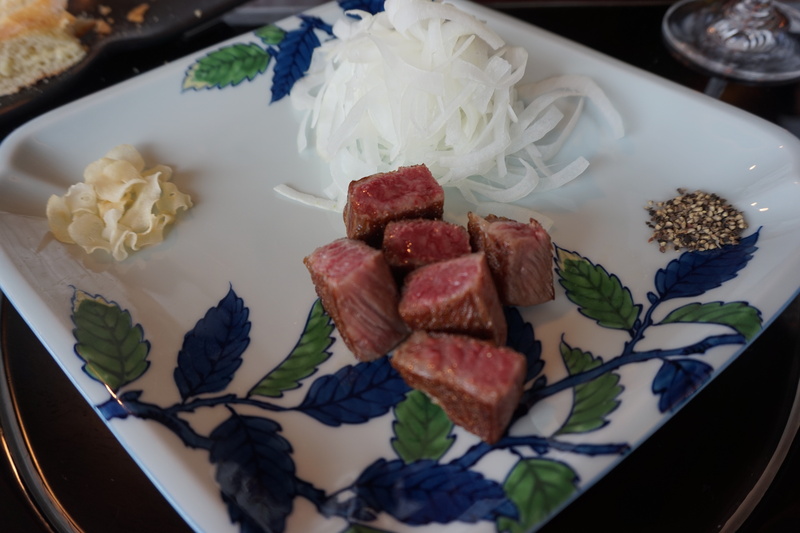 Lunch started off with seared kobe beef. 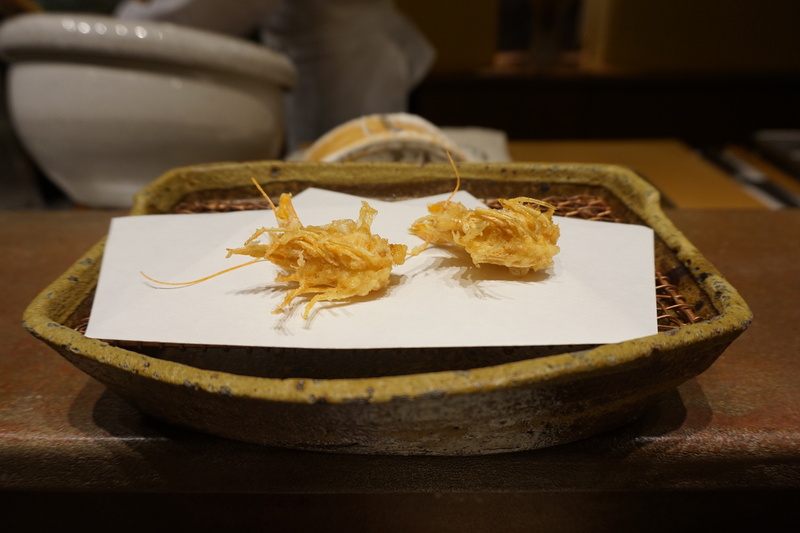 It was an interesting dish to taste, although I can’t say I’m a fan of this style of preparation. 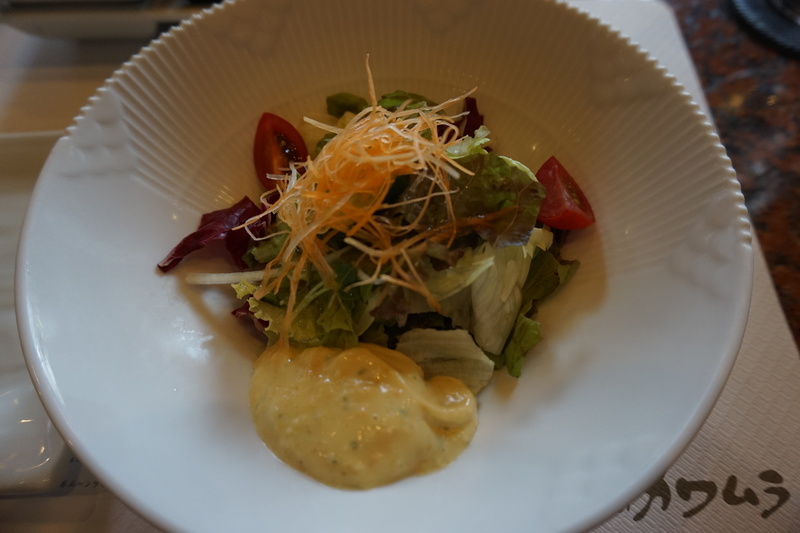 The salad was decidedly ordinary- mixed greens with a generic sauce on the side. 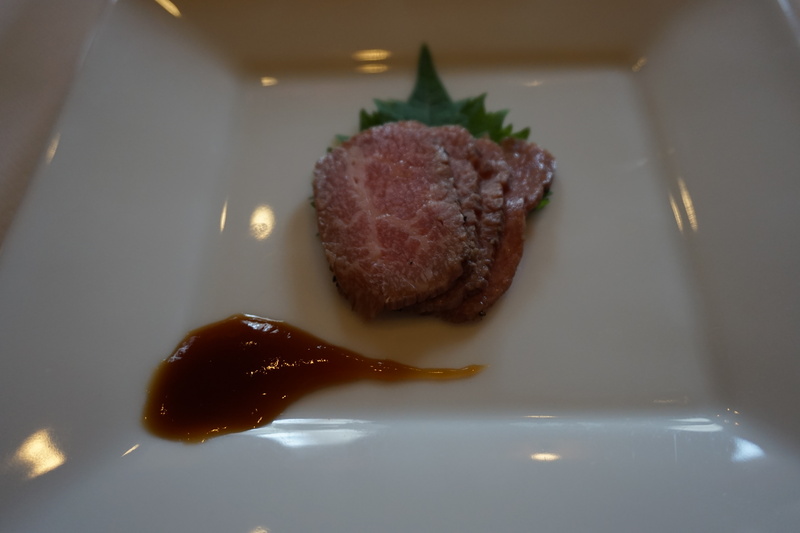 I really couldn’t tell the difference between this beef and that served at Ukai-Tei. Both were cooked to perfection. 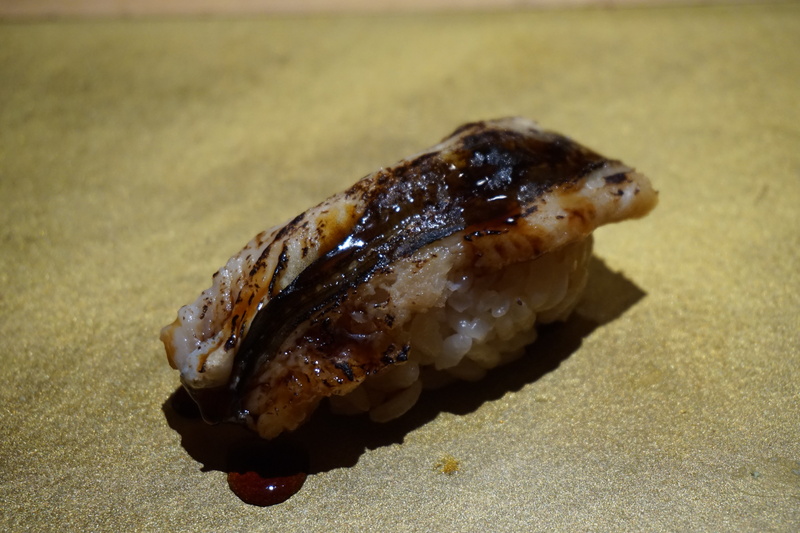 Definitely Ukai-Tei’s way of presenting the food was more engaging, but tastewise I was satisfied with both. 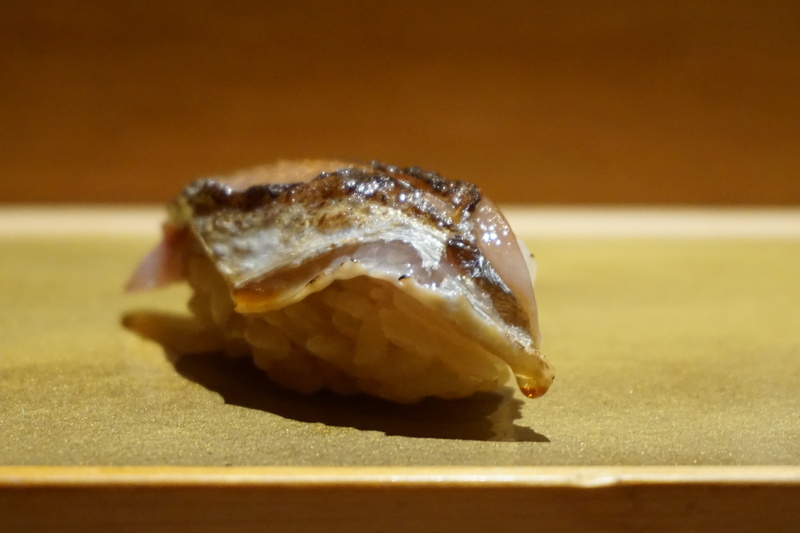 You might want to check out Hakushu and Matsurokuya. 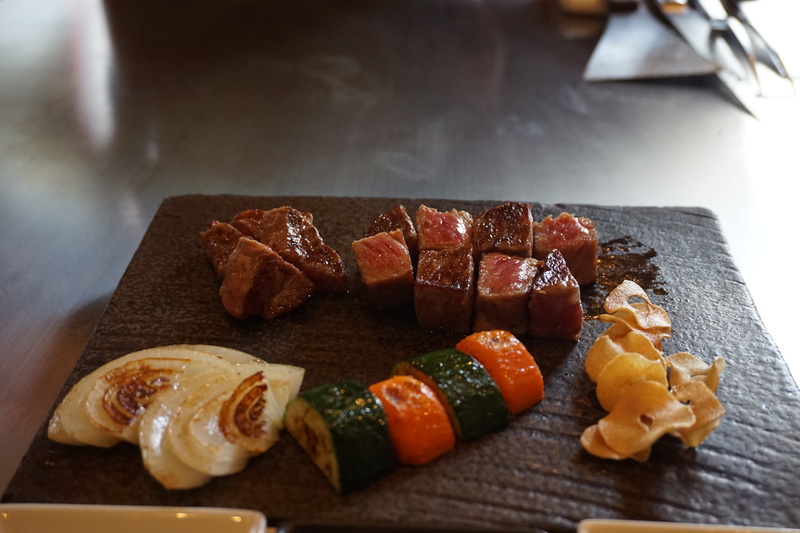 Matsurokuya in particular is famous for serving a 1,500 yen set lunch with A5 Kurogewagyu, but limited to 30 portions per day. Check it out here. 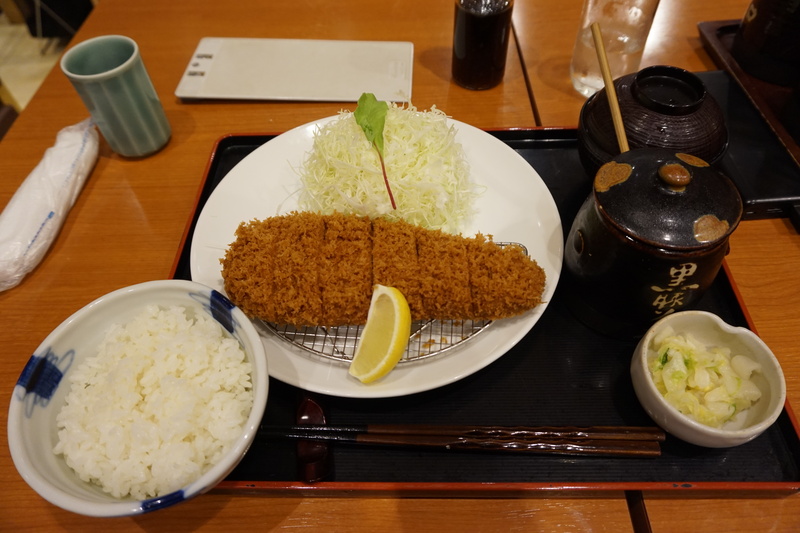 Maisen tonkatsu is generally known to be the place to get your tonkatsu in Tokyo. 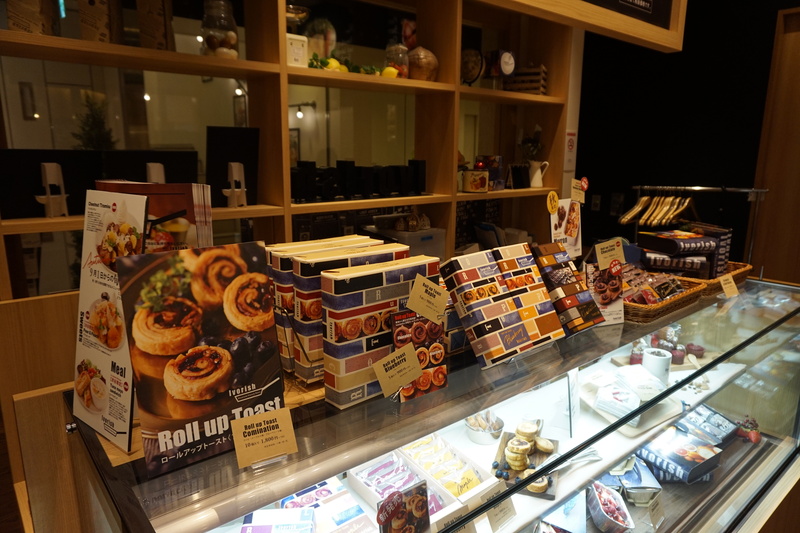 Although most people recommend you visit the outlet in Omotesando, I wasn’t fancying joining a long queue. 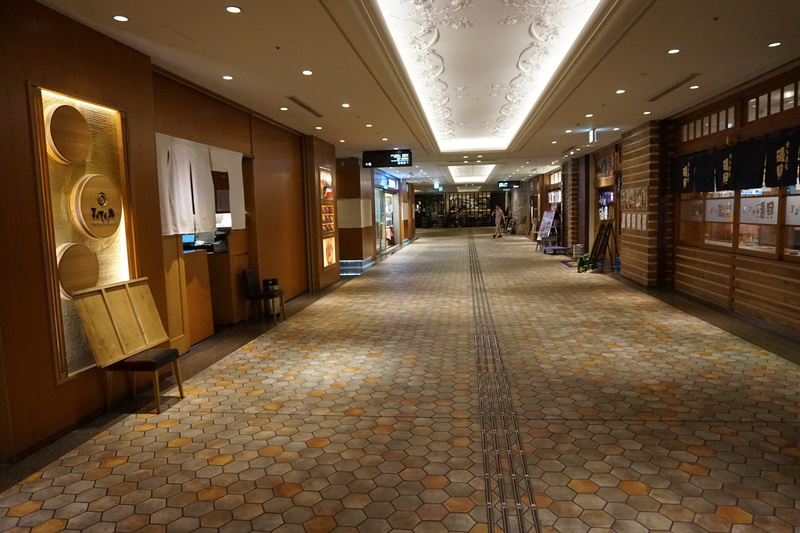 Instead I went to the outlet in Shibuya, which is on the top floor of a department store. 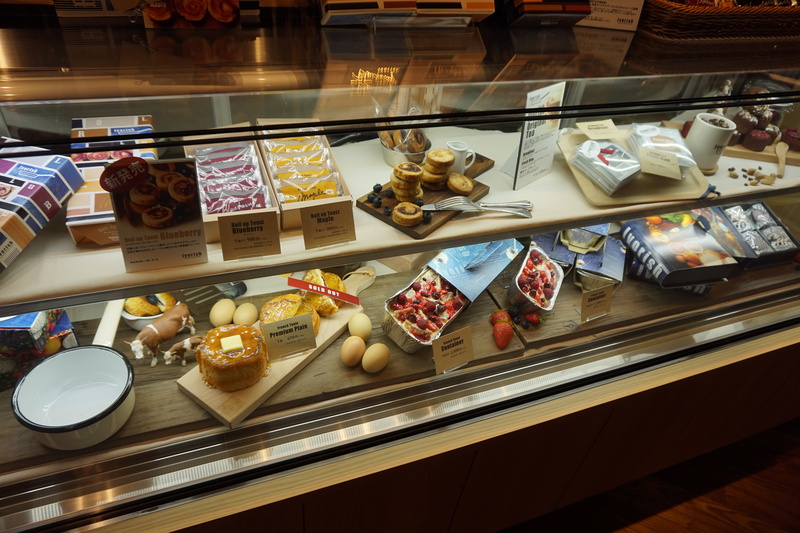 There was no line at all (but then again I reached at 5pm) and I seated immediately. 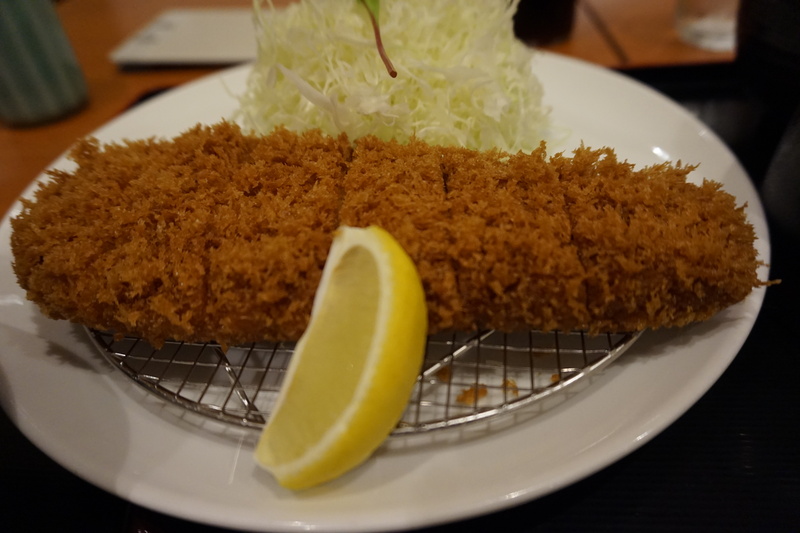 I had the Kurobuta pork loin set, which is supposed to be more fatty than a fillet. 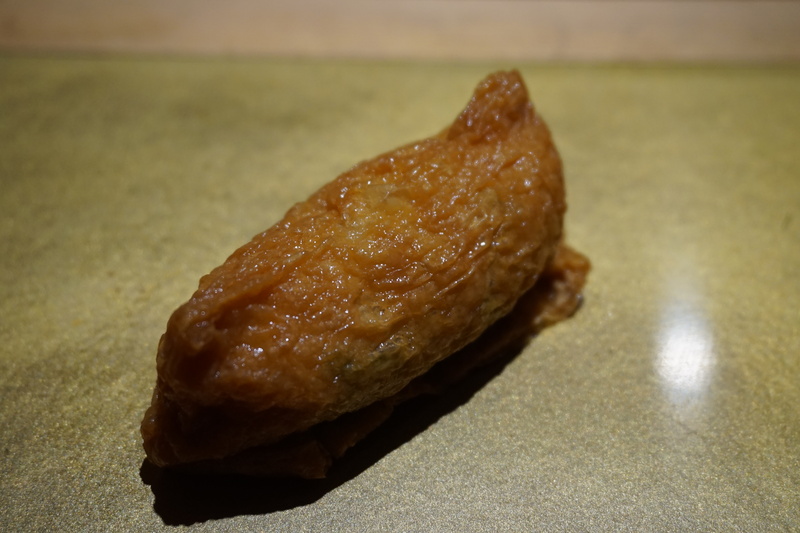 The dish came out 15 minutes later, gloriously crispy and hot. 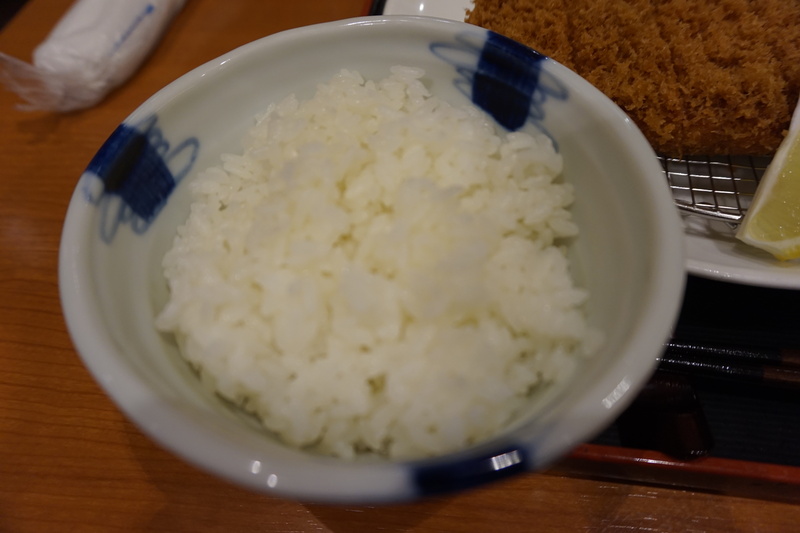 Rice and white cabbage come with free refills, which is dangerous for someone like me who is addicted to Japanese rice. 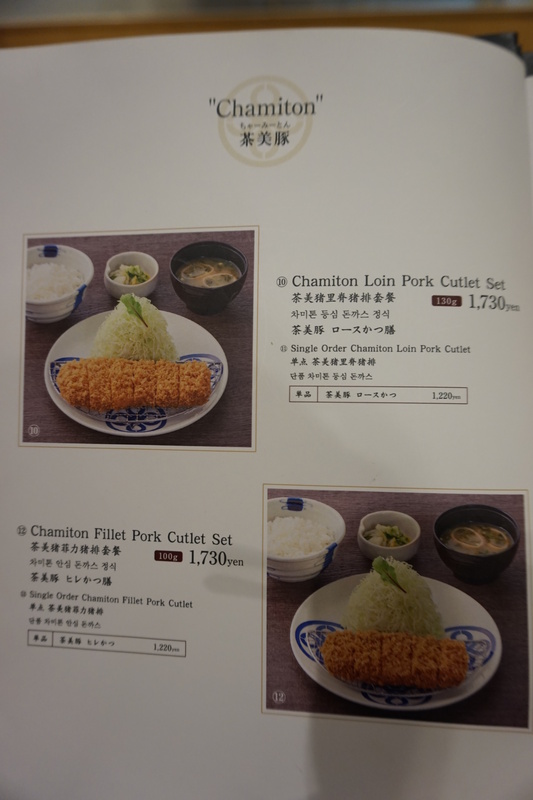 I’m sure those in the know will probably have identified better hole in the wall tonkatsu shops. 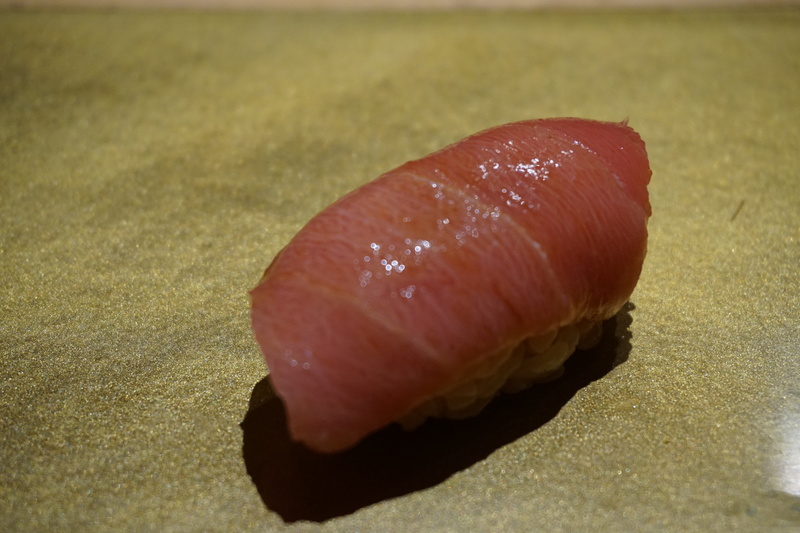 But this is a good place for you to go if you’re a relative novice and want something accessible yet good. 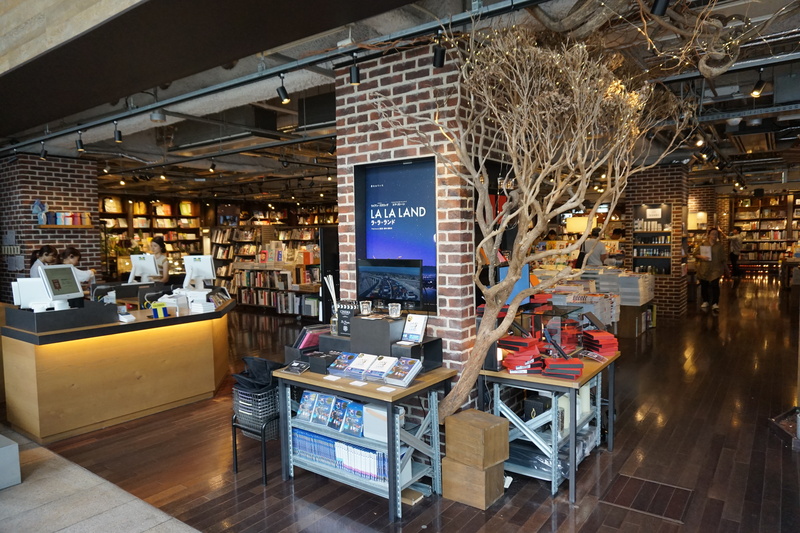 Roppongi Hills is a very lovely new development in the Roppongi area, and home to my favourite branch of Tsutaya Books. 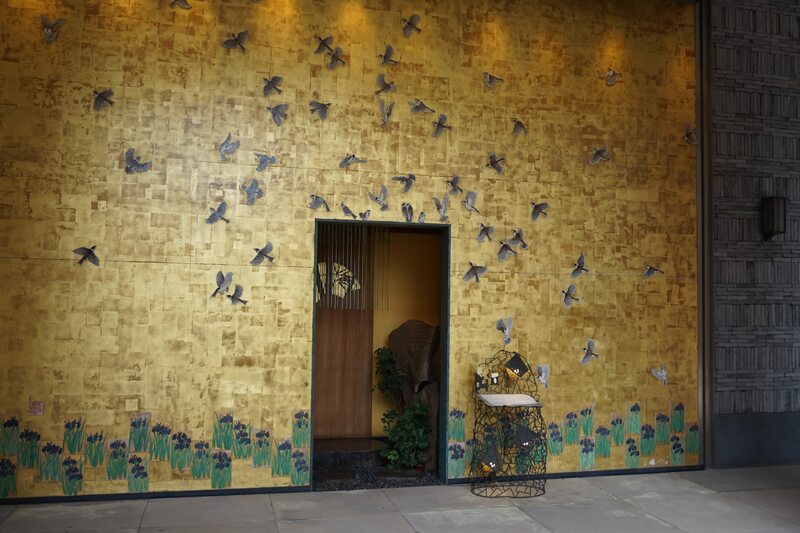 This place is just stunning and whoever did the interior design needs a knighthood. 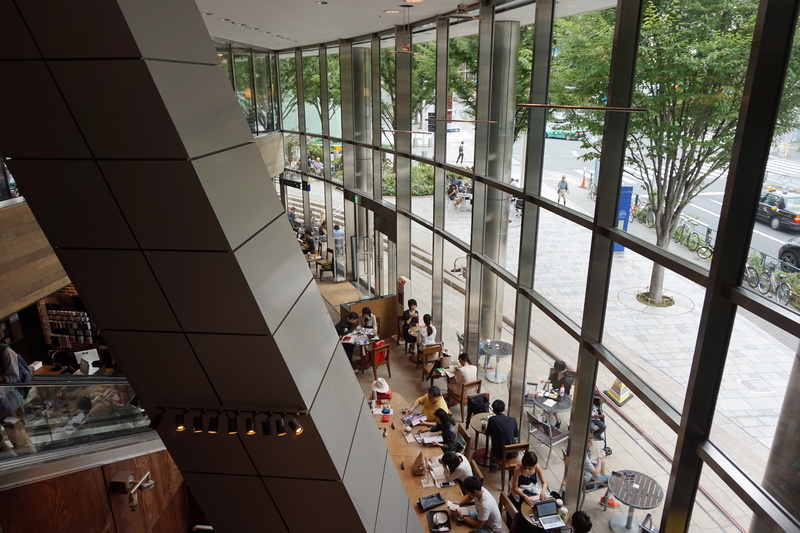 The restaurant is part of the Roppongi Hills complex, on the top floor, and is hard to spot, not least because there’s no name on the outside either in English or Japanese. 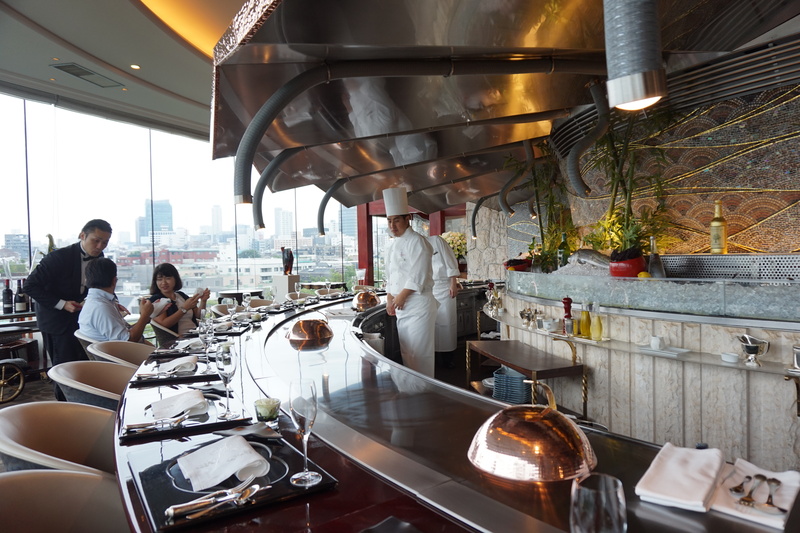 The interior is cozy, with a chef’s counter and a few private low tables. 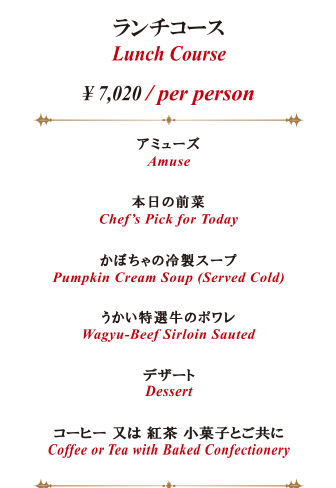 There are two options for lunch priced at 7,128/8,856 JPY (S$88/109). 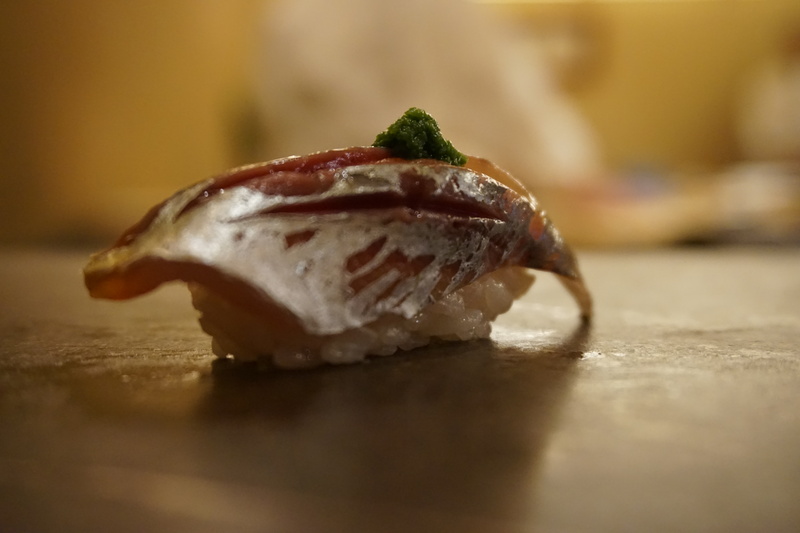 The main difference is that you get an additional type of fish with the more expensive course. That’s got to be quite a fish, for a $20 price difference! 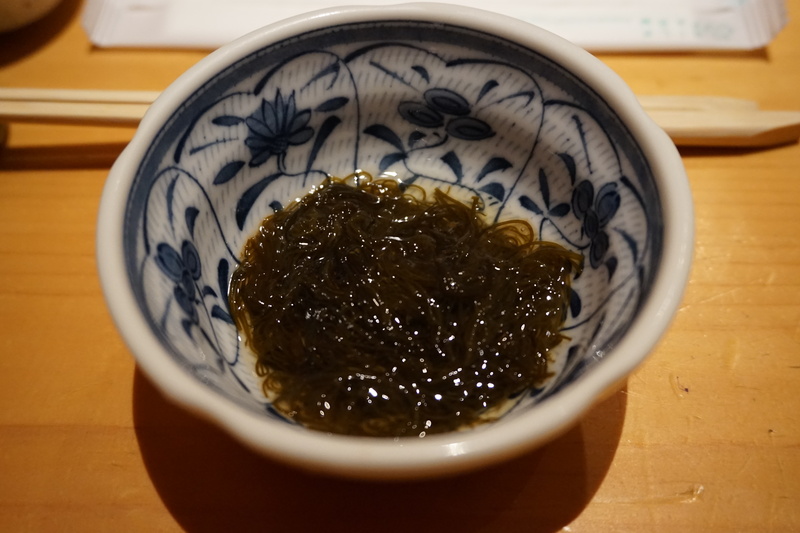 The first step with tempura is to mix your own sauce (Ten Tsuyu) with grated daikon and a mixture of soy sauce, dashi and mirin. 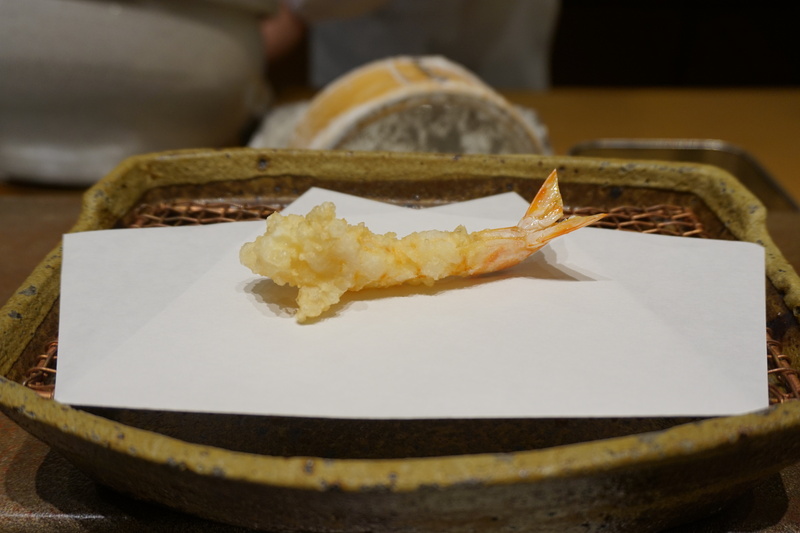 A tempura restaurant works much the same as a sushi place, in that you have a plate infront of you which the chef portions out freshly prepared food as and when it’s ready. 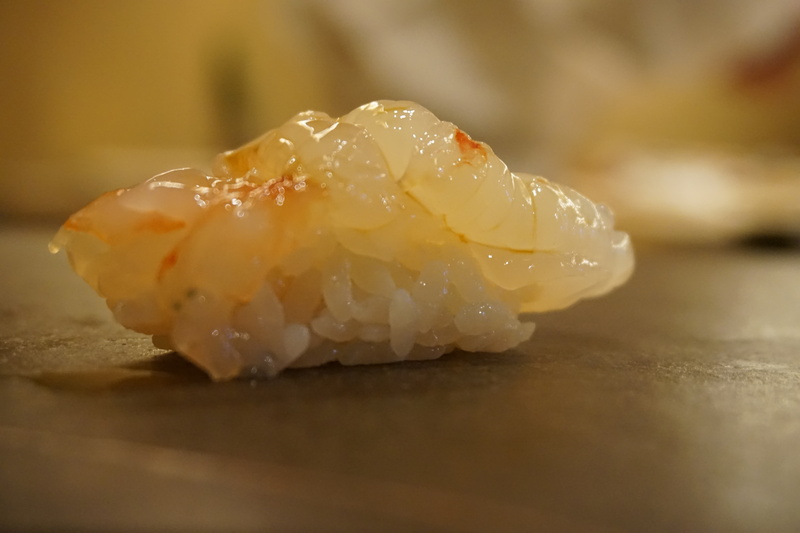 He first took a live prawn from a container (they were still moving), cleaned it and whisked it in the boiling oil. 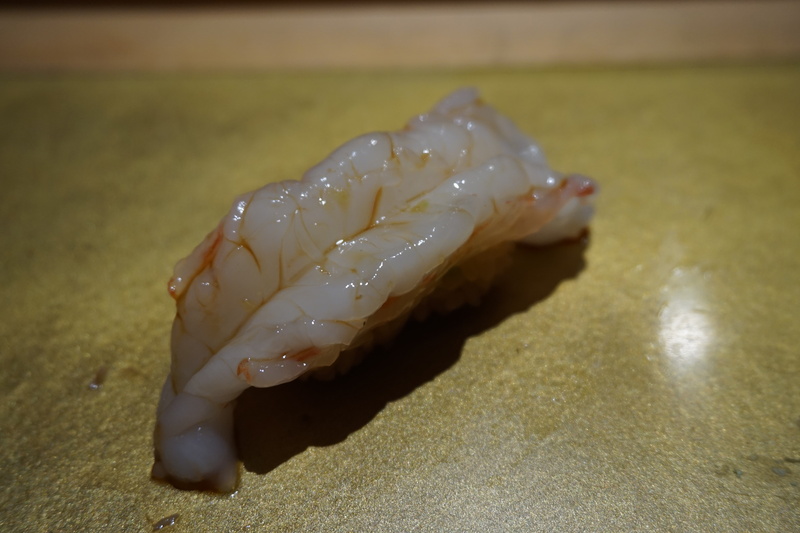 Minutes later I had what must have been the freshest prawn tempura I’ve ever had. 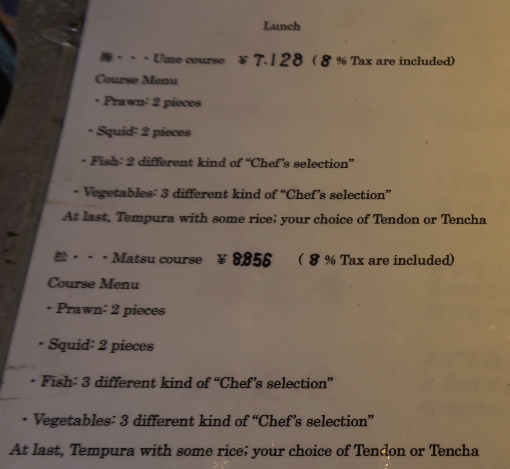 He then proceeded to serve another type of fish, plus some squid. 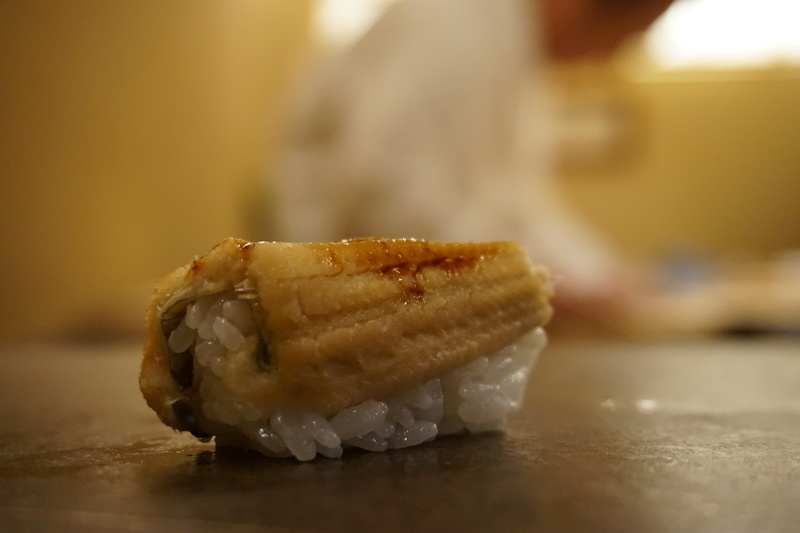 And a piece of eel that he dramatically broke in half with a tap from his chopsticks. 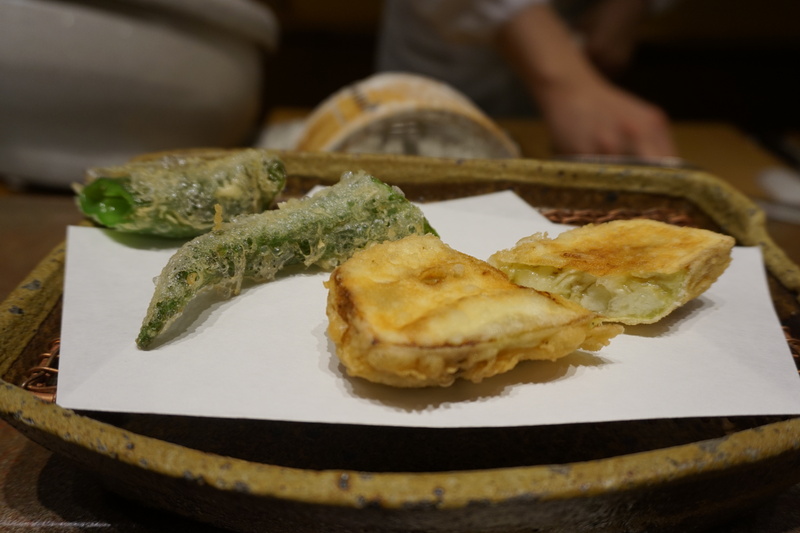 Japanese green peppers and eggplant followed. 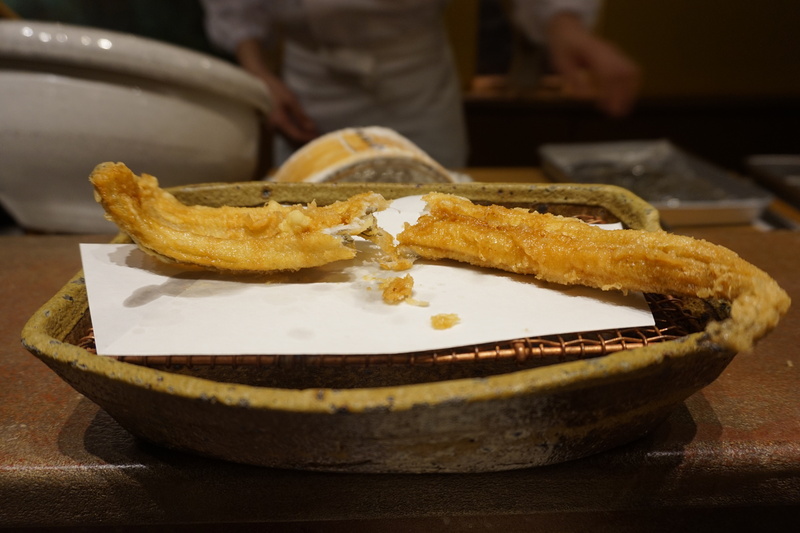 The meal is rounded off by something called tendon, or tempura donburri. 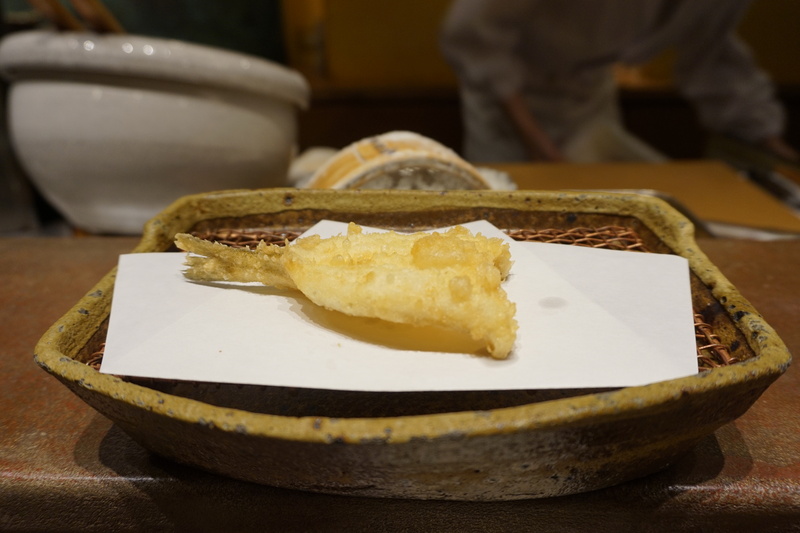 This is deep fried tempura bits ( I tasted prawn inside mostly) served over a bed of rice, accompanied by Japanese pickles and a bitter tasting soup. 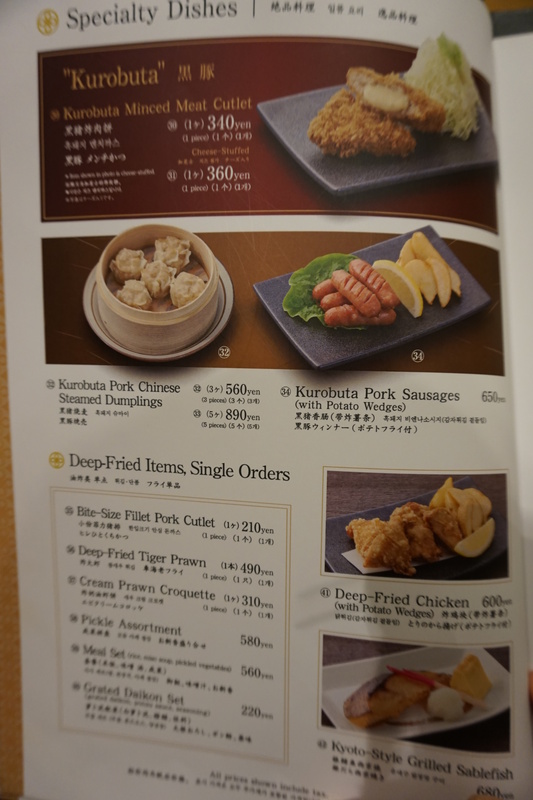 It was a bit too much fried food for me, but if you do enjoy your tempura you might want to give this place a try, or one of the ones listed below. 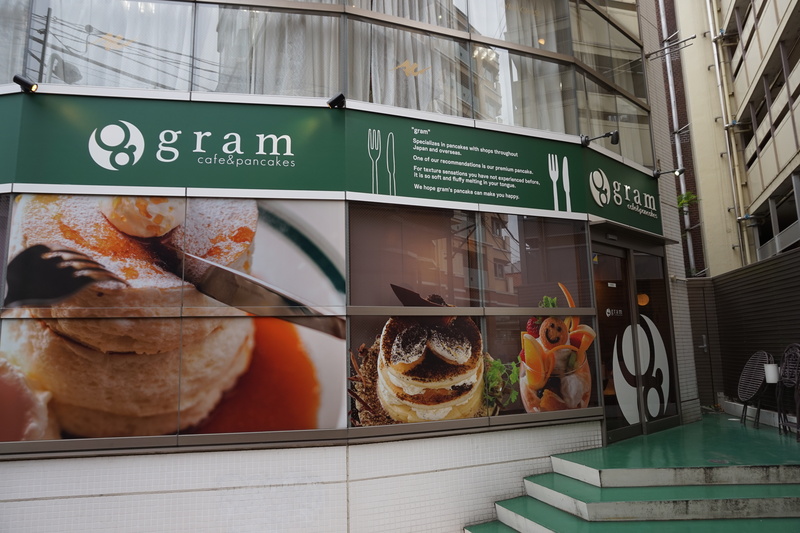 Cafe Gram is famous for pancakes made with souffle. The resulting pancakes are so light and fluffy, they actually jiggle when you shake the plate. 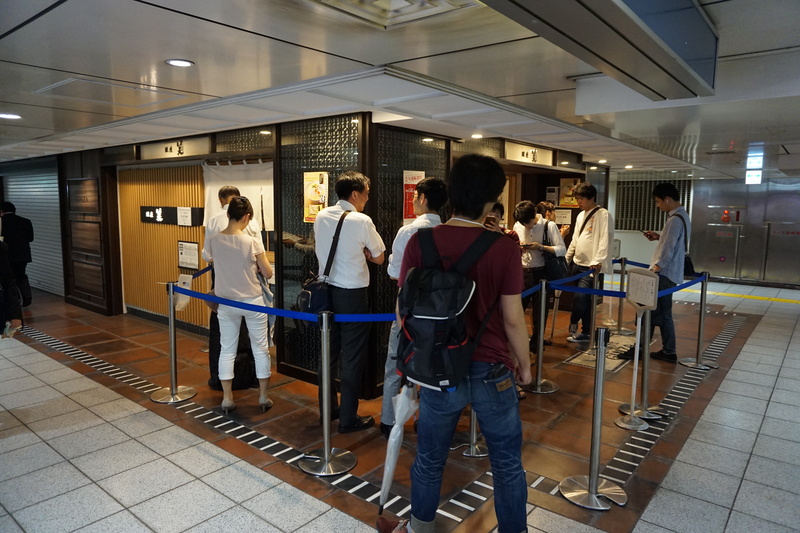 Although they don’t take reservations, they at least have a system in place so you don’t need to queue. Try and arrive about 30 minutes before the serving time. 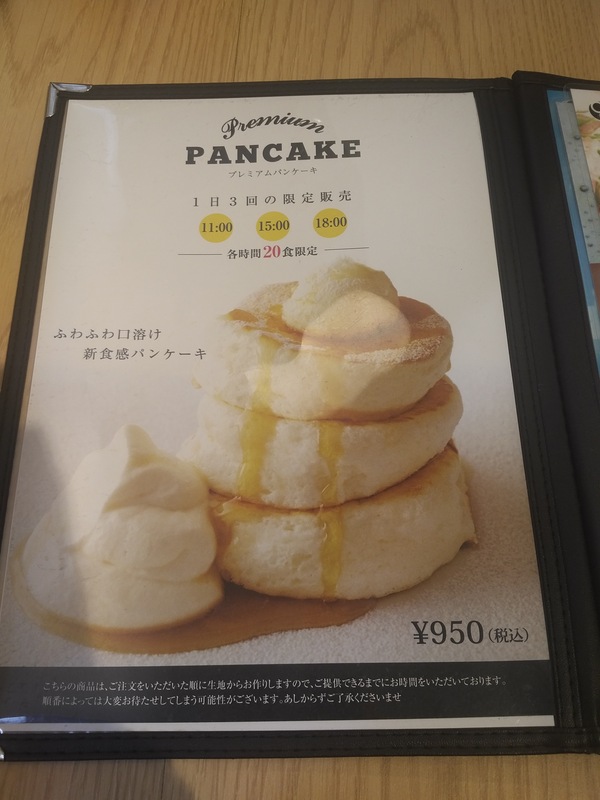 Tell the staff you’re here for the “premium pancakes”, as they call them. They’ll know what you’re talking about, but anyway here’s the photo for reference if you want something to point to. Hold on to that card with your life! There’s no pancakes without it. Return at your appointed time and you’ll be shown to a table without any wait. And here it is. 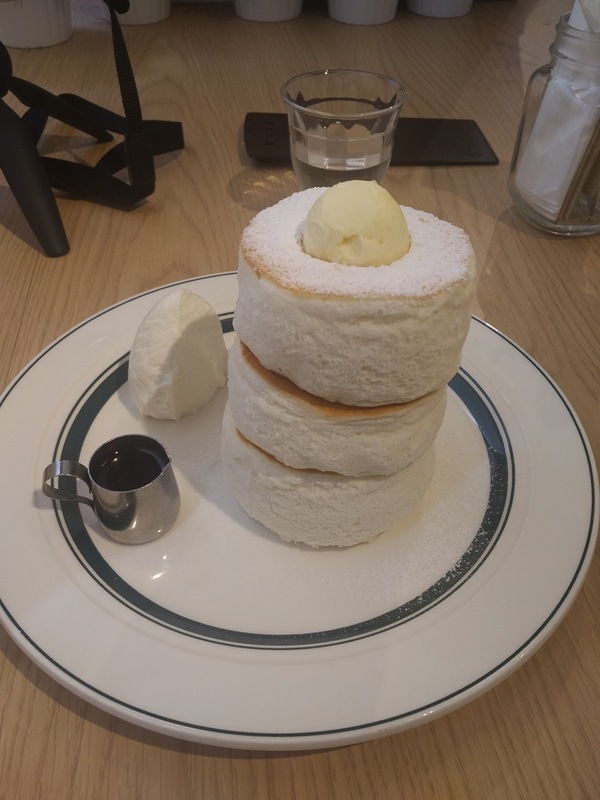 Three perfectly fluffy, warm and jiggling pancakes, served with a dusting of powdered sugar and butter on top. Maple syrup and whipped cream on the side. 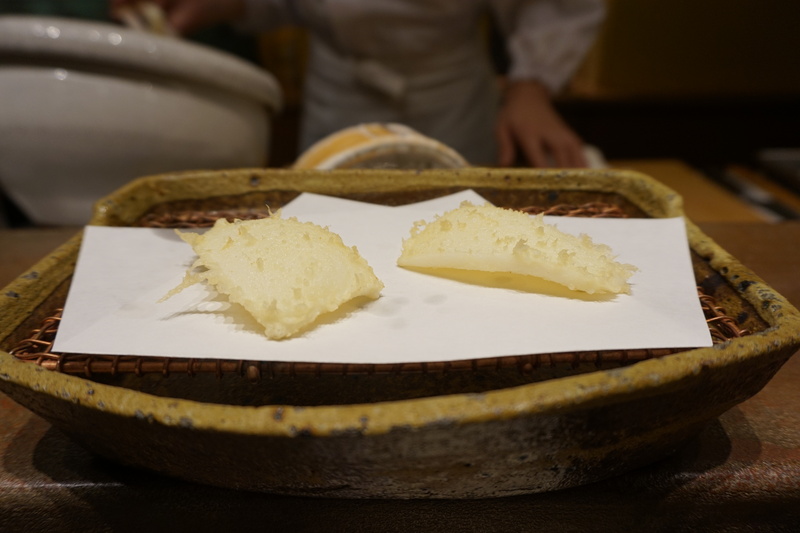 The pancakes were transcendent, like eating a cloud. Highly recommended. 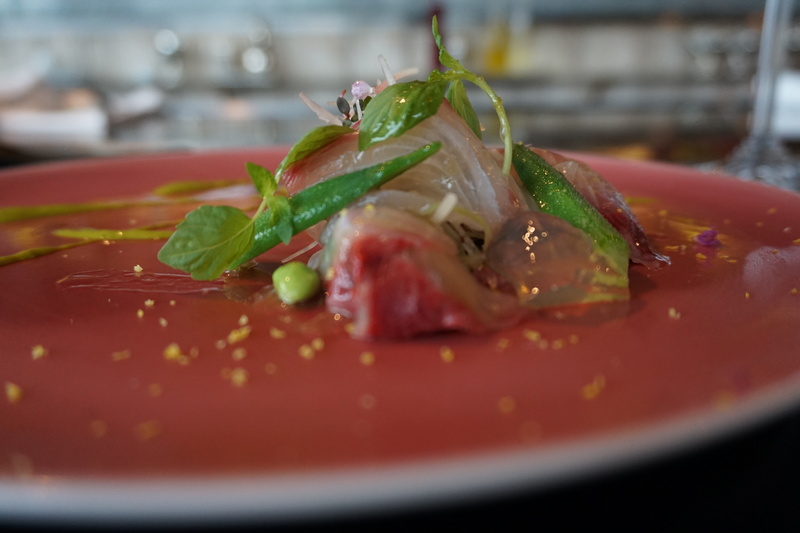 Bill Granger is an Australian chef known for serving what’s been called the best breakfast in the world in Sydney. 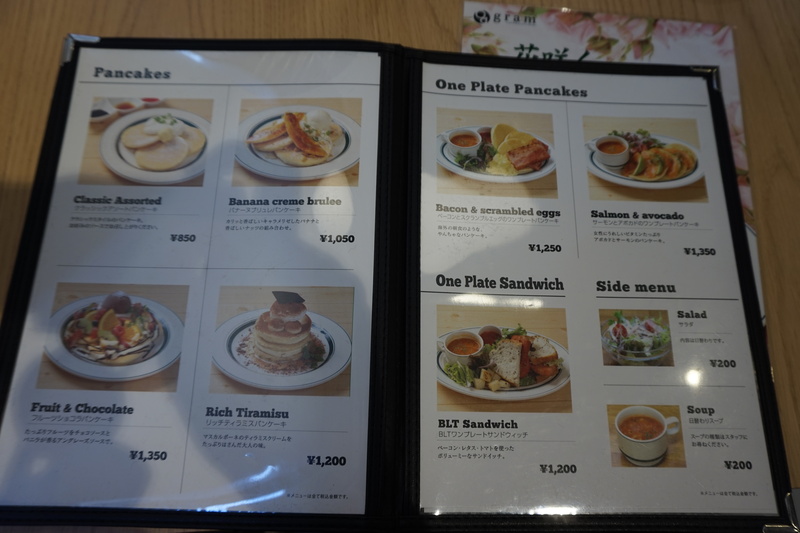 His expansion to Tokyo has brought much excitement amongst the locals, especially around the pancakes. 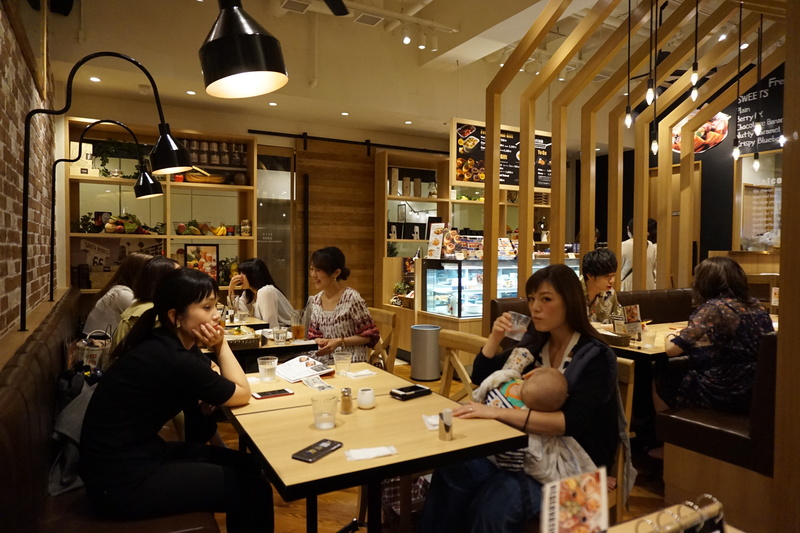 Bills has been open for years already and has since branched out into 4 locations around Tokyo, but the main outlet in Omotesando still attracts long queues (probably on account of its really high ratings on Tripadvisor). 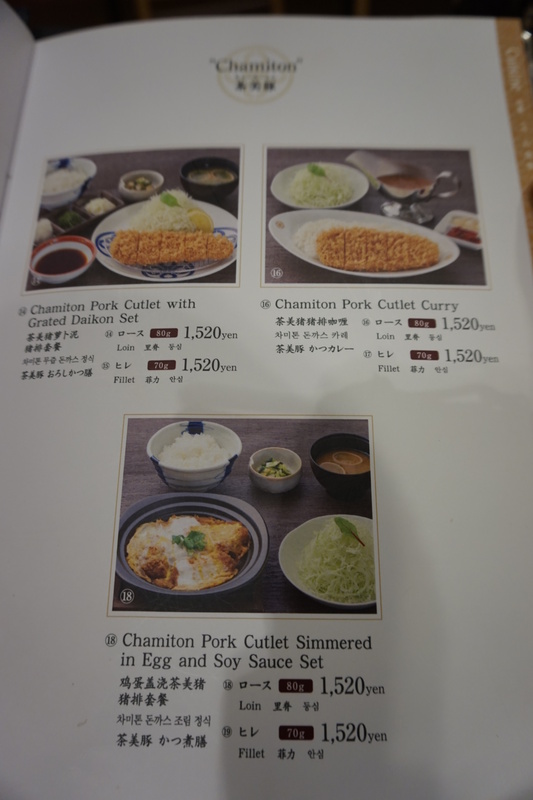 Protip: either make a reservation online (the whole site is in English) or just go to the Ginza outlet. 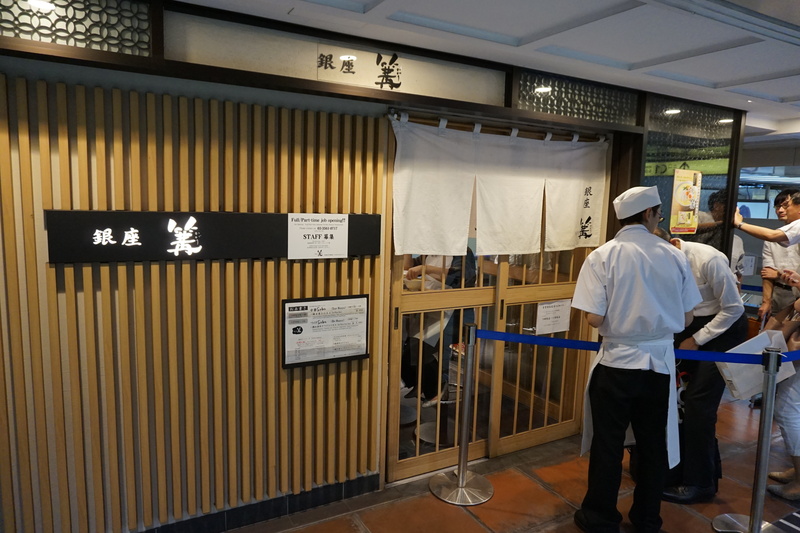 There was no queue when I showed up at 9.30am on a Tuesday morning. 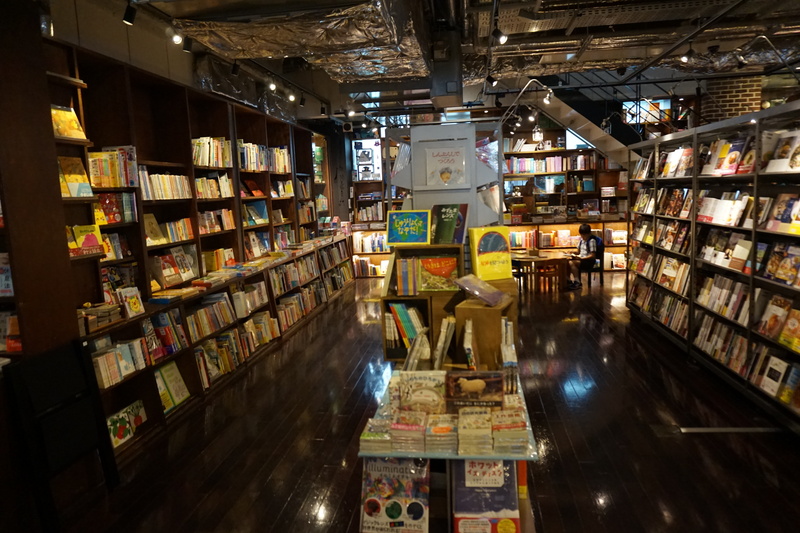 There was no queue and I was seated immediately. I was warned the pancakes would take 20 minutes to arrive (they took 30 in actuality), but man was it worth the wait. 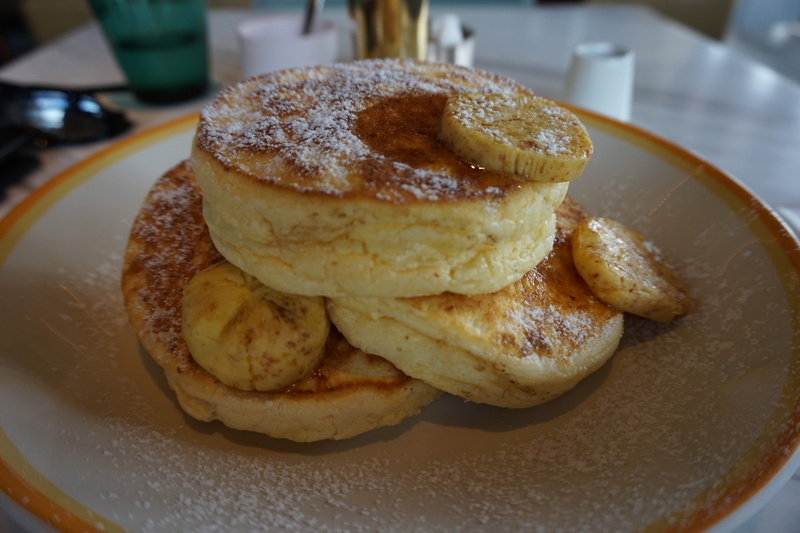 The pancakes were like pillows, and the honeycomb butter added an amazing richness to the hot pancakes as it melted. 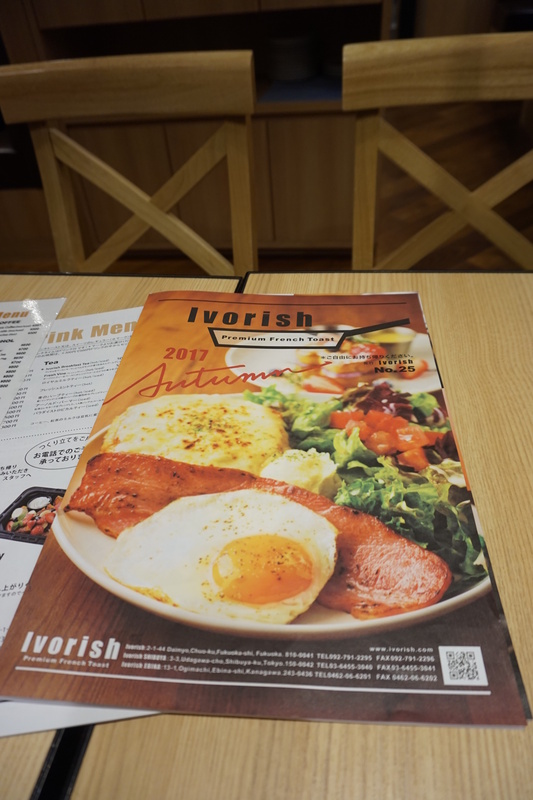 This dish has been called “the best breakfast in the world”, and perhaps that’s a bit of a stretch, but I’d definitely put it as a must try. 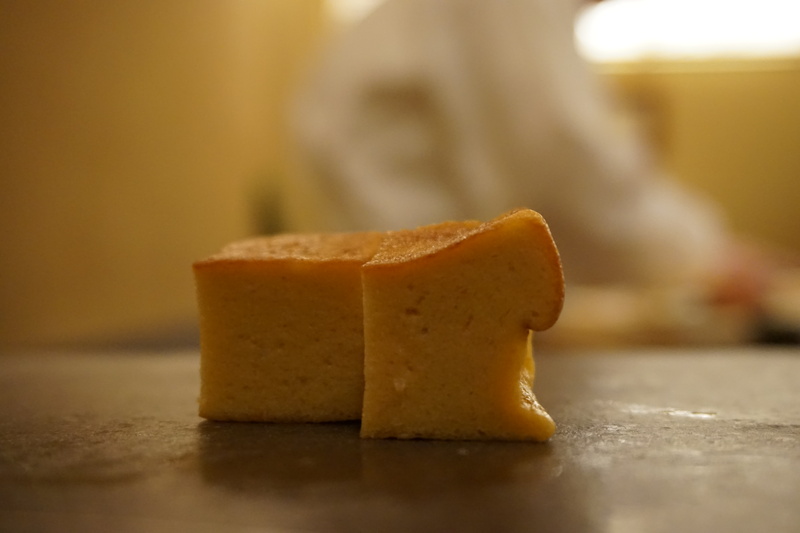 Shibuya toast may not actually be a Japanese thing, but Japanese french toast is a thing. 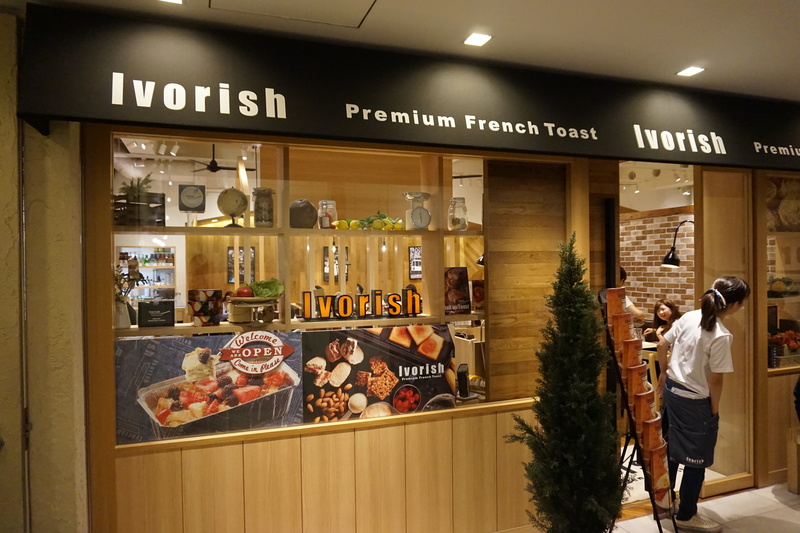 And few do it better than Ivorish. 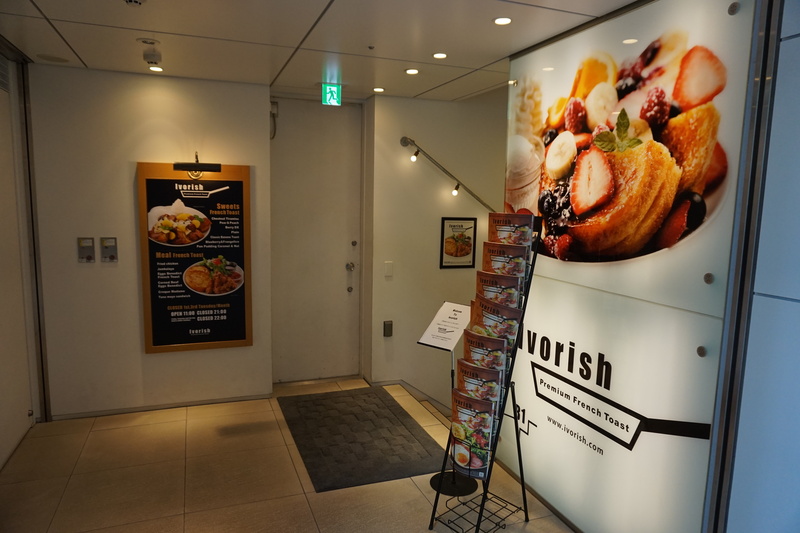 Ivorish is in the basement of an office complex in Shibuya. It’s a short walk from the train station and a place to take a welcome break from all that walking. The queues at this place can be unpredictable. The last time I had to give this place a miss because the queues were stretching all the way up the stairs from the basement and to the entrance of the office complex. 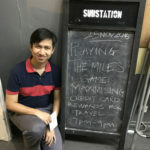 This time when I went, there was no queue at all (although by the time I had finished a queue had formed outside at about 5pm). 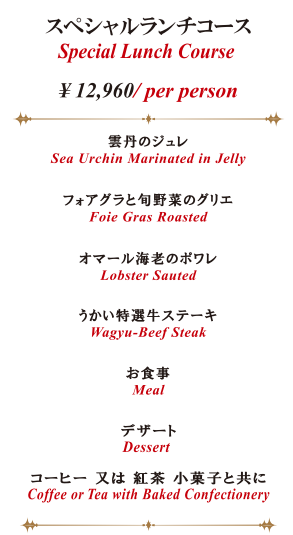 Here’s a copy of the menu for your reference. 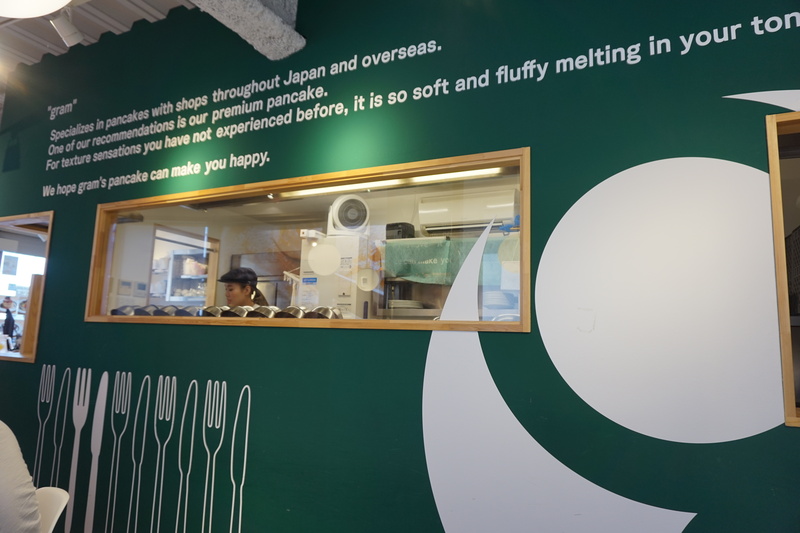 I’m sure some of you might like to try the other items, but there was one thing on my mind though- their premium plain toast. Don’t let the name put you off; this is simplicity at its finest. 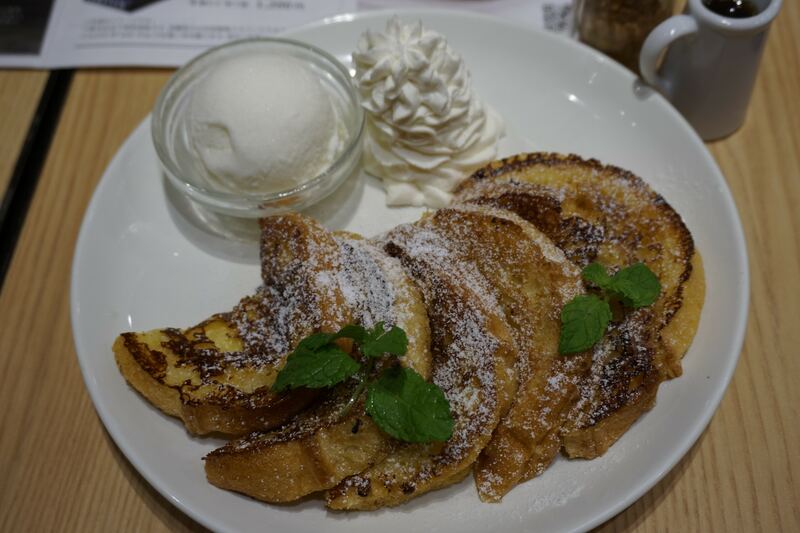 Five pieces of perfectly cooked french toast, with a drizzle of maple syrup, powdered sugar and very rich vanilla ice cream. A final tip on sweets. 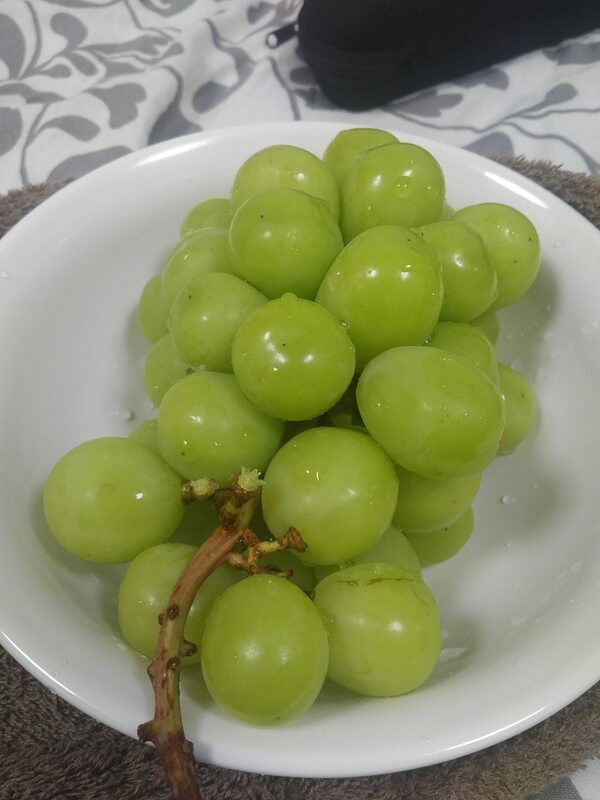 I love Japanese fruits, but they’re ridiculously expensive. 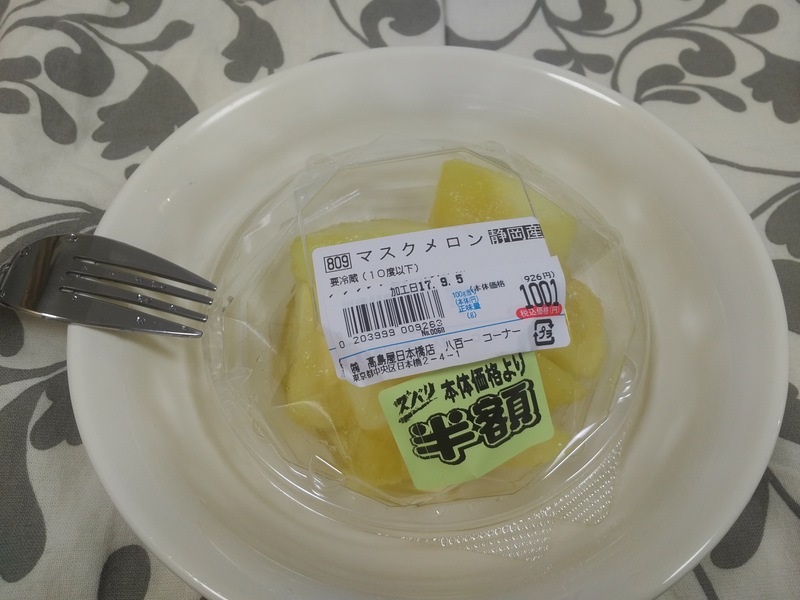 But I realised that Takashimaya sells its cut fruits at half price towards closing time. 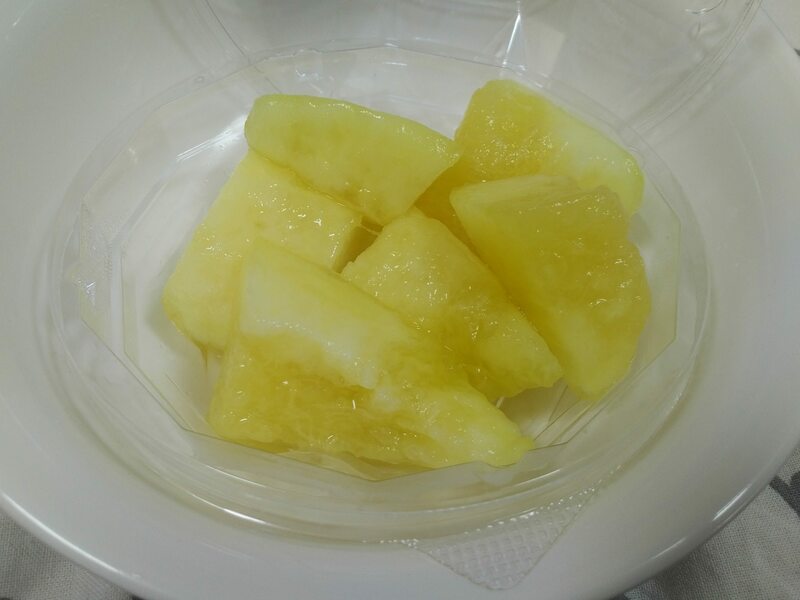 That’s how I got one portion of delicious muskmelon for 500 JPY instead of the regular 1,000. 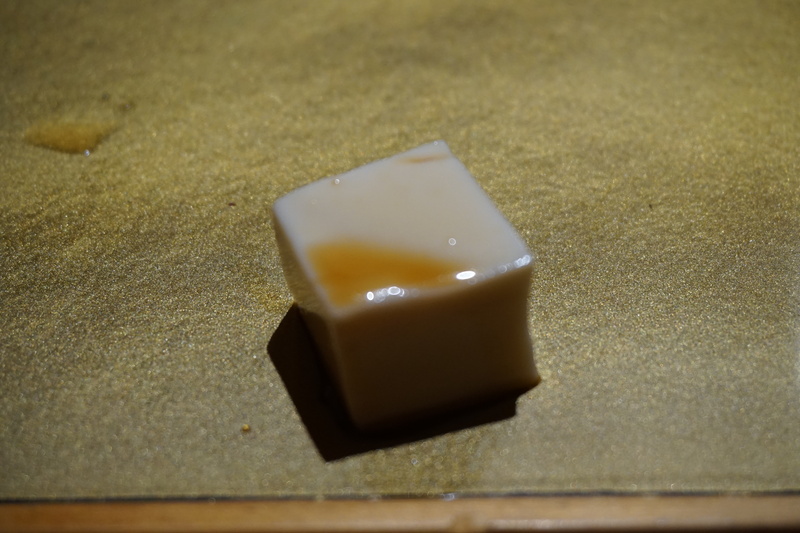 Each piece was like eating pure honey. 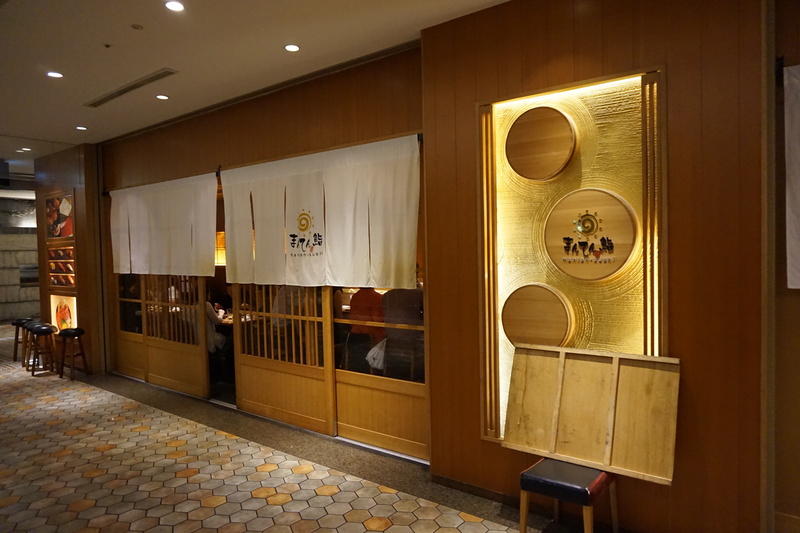 Hidden away in the Ginza subway station is Ginza Kagari, one of the best kept secrets in Tokyo. 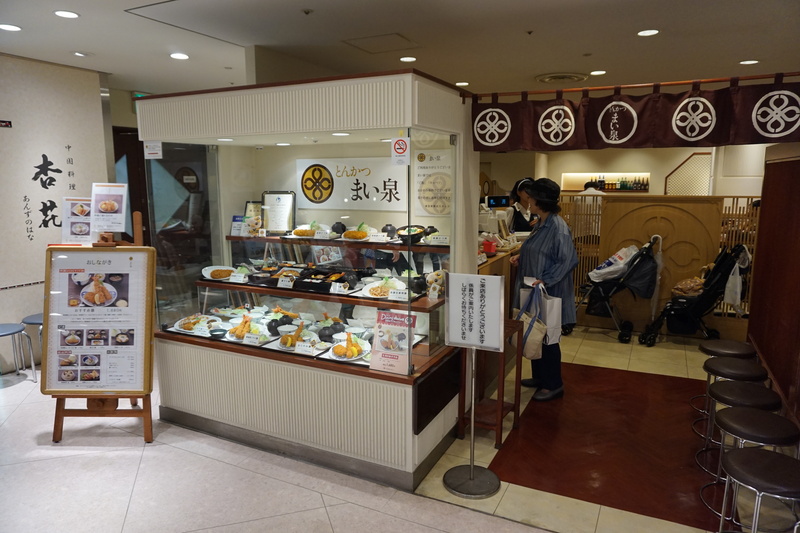 The original outlet of Kagari can attract queues of up to an hour, but the lesser known branch in Ginza station has much more reasonable 15-20 minute waits. 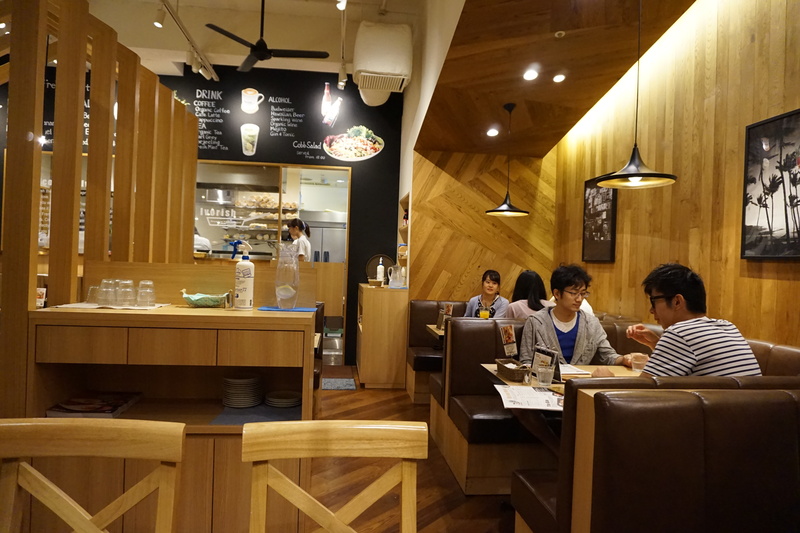 8 people fit into this tiny ramen shop, all slurping away at a heavenly broth of chicken ramen. 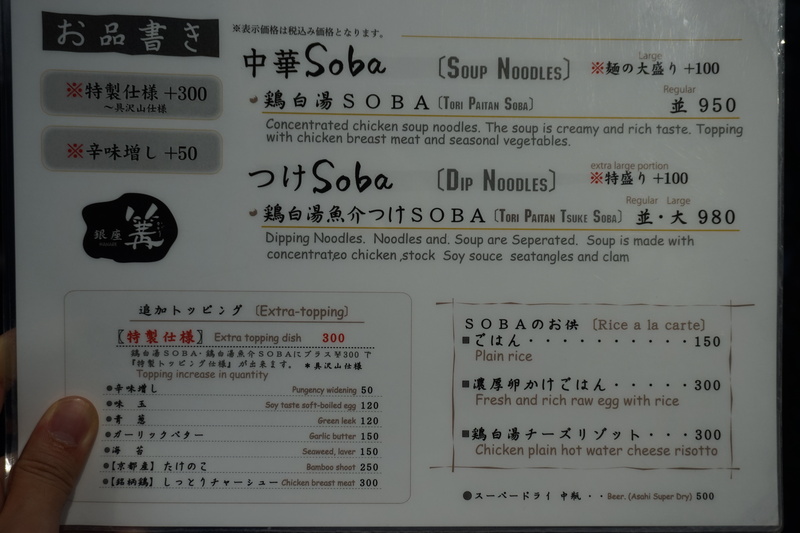 The slightly confusing thing is that the restaurant calls its noodles soba, but they’re really ramen. 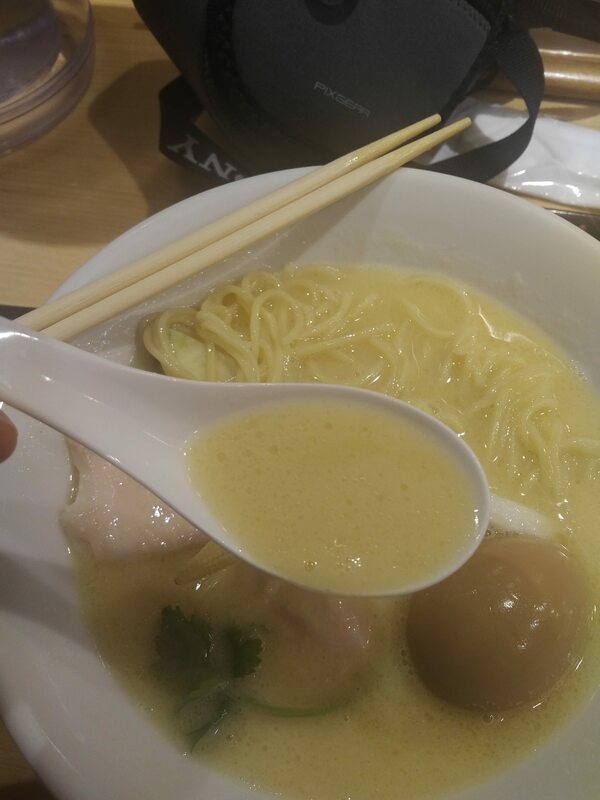 A bowl sets you back 950 JPY, or S$12. 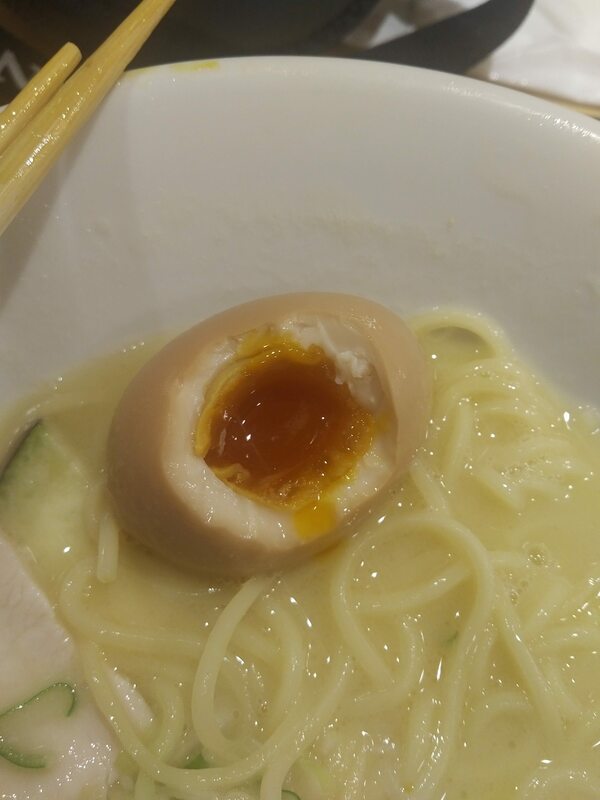 The broth is incredible- it reminds me of the collagen soup at Tsukada Nojo in Singapore, but mixed with soft velvety chicken, fresh vegetables and an egg with a molten core. Seriously, the soup is amazing. 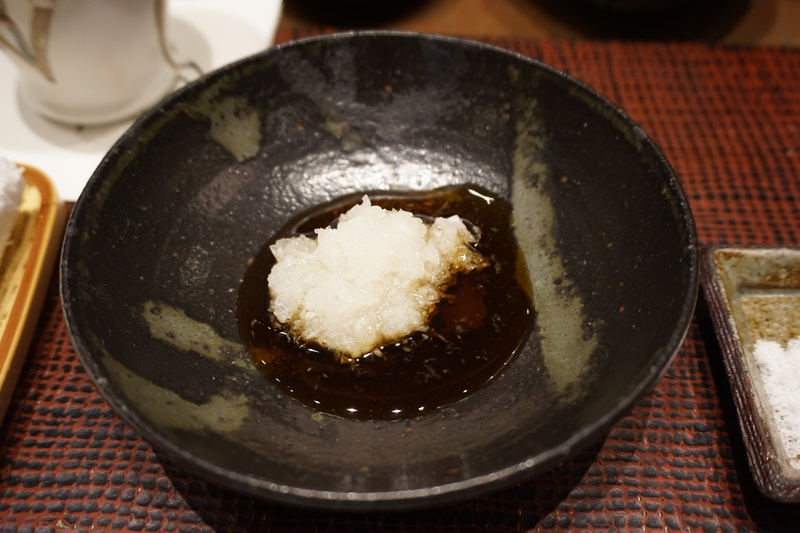 The richness of chicken fat lingers in your mouth long after, and I’ve seen people ordering rice on the side just to pour the remaining soup over. 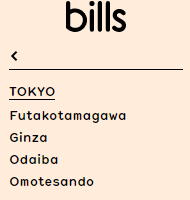 So those are some of my Tokyo restaurant picks. Hopefully this gives you a good foundation to go out and explore more! oh dear… i just wet a pack of tissue..
Ahhh finally you have nice photos to match your delightful words! Always a pleasure to read your reviews – love your witty sarcasm! Great write up and thank you 🙂 Just in time for my Japan trip in November. 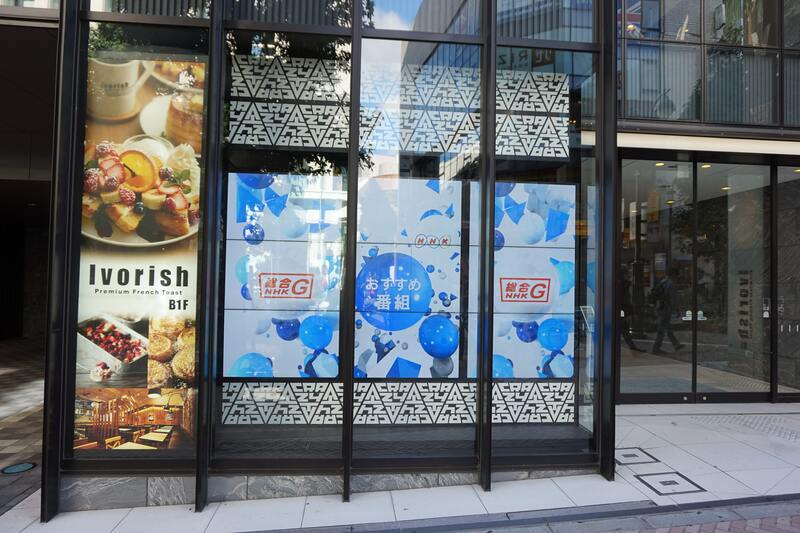 Just wondering , does Ukaitei accept credit cards ? shhhhh. i’m trying to annoy louis. 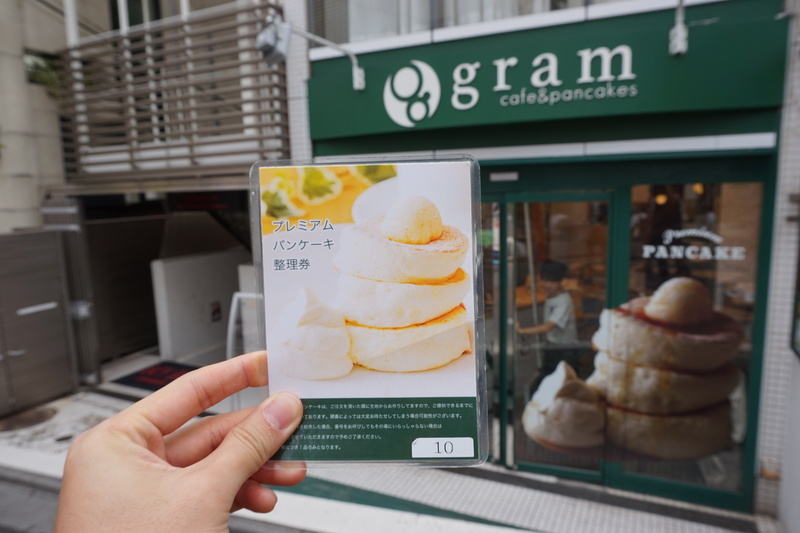 Don’t be confused by the name at Ginza Kagari. 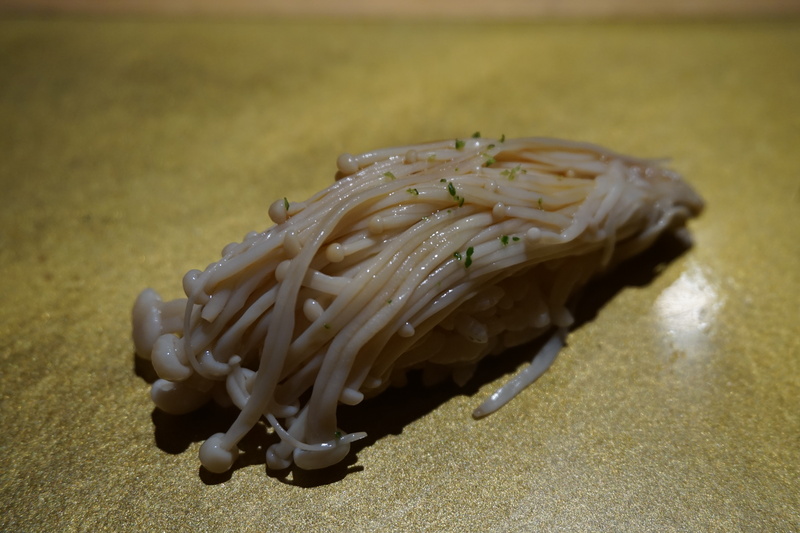 Ramen is traditionally called chūka soba (中華そば) or shina soba (支那そば). 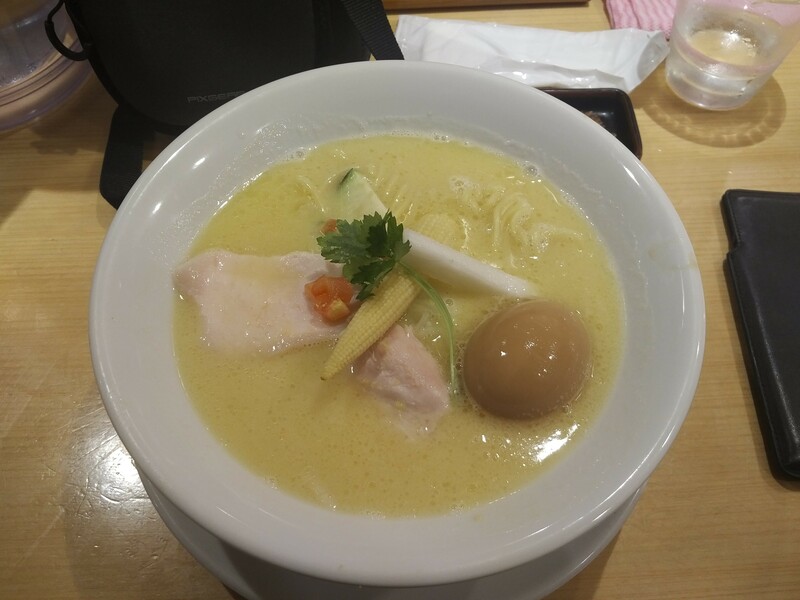 Both mean “Chinese noodles”, as ramen is a foreign (Chinese) and rather recent import, which evolved into an entirely new life in Japan. 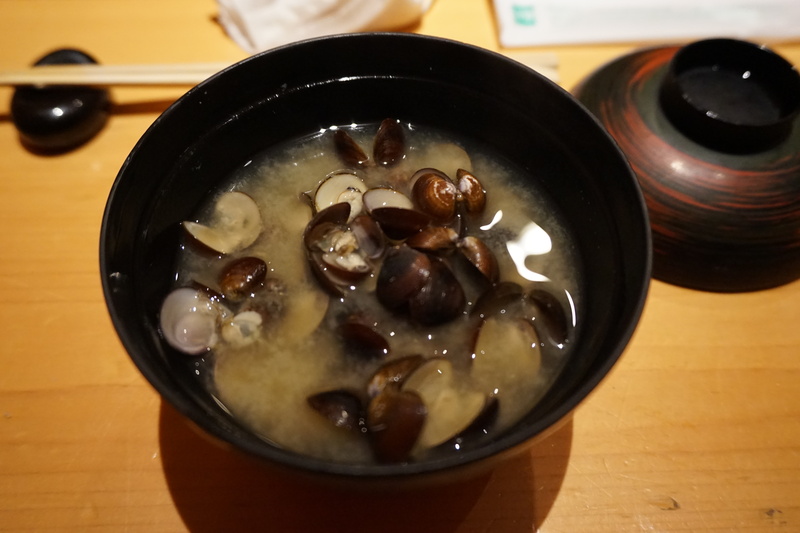 The word shina was considered offensive and the actual Chinese term “ramen” (拉面) gained traction instead.